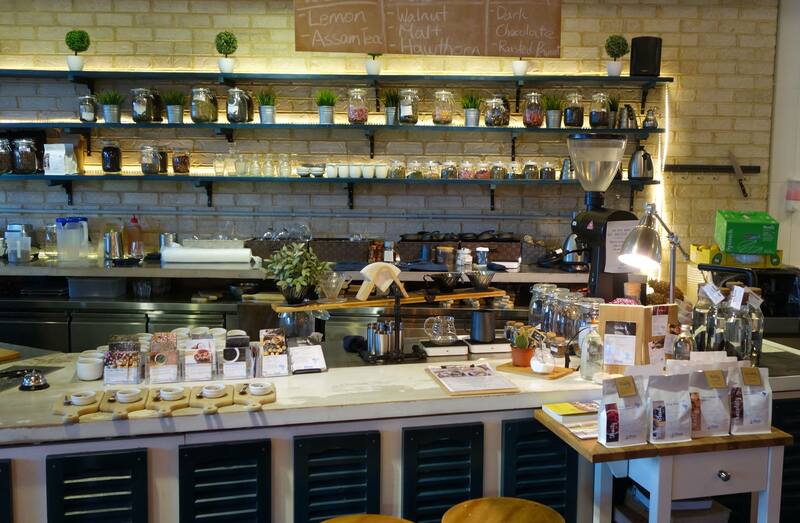 Situated in Bangkok, the must visit Namsaah Bottling Trust is an interestingly cool and quirky restaurant. This converted villa is certainly eclectic, decorated with a colourful mosaic tiled entrance, pink exterior, white shutter windows and and chandelier. You are drawn in by this and the interesting choice of music which reaches out and grabs the attention of you eyes and ears. We enter the establishment with curiosity. Once inside, the decoration of the exterior is further extended through and as you walk in, the main wall as you walk in is blue with glittering silver leopards. We are taken up stairs where there are a number of separate dining areas with ostrich feather chandeliers, purple rhino heads looking down at you, old fashioned floor standing lights with colourful shades lined with tassels. 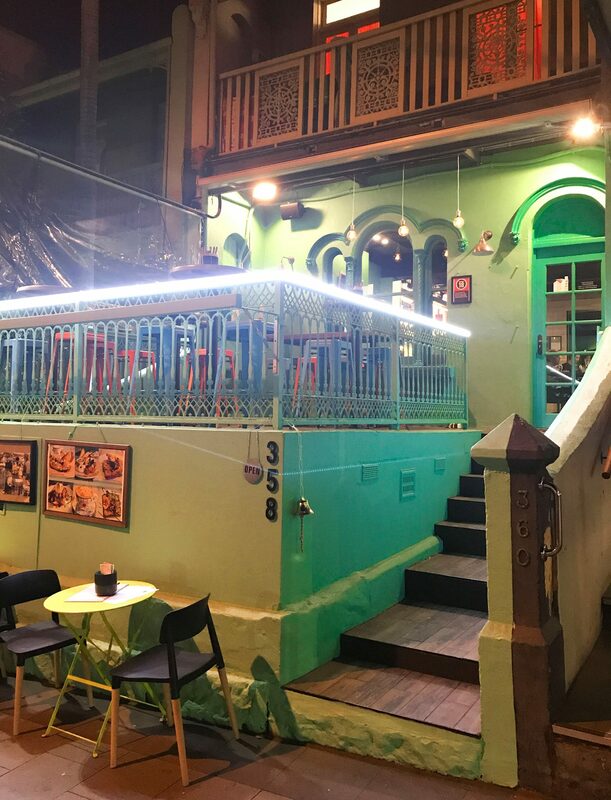 The furniture is Victorian Era with dark wooden chairs, colourful pink couches with intricate joinery and lush drapes in the internal door way between dining areas. The white table cloths are the only thing that resembles your standard restaurant. A friendly waitresses in her bright pink dress originally greeting us in the car park, it was a wet night, but do not despair, we were provided with umbrellas, bright pink of course. Once seated we were provided with the menus, it was a little dark to read, this we believe was by design to play to your other senses. We were provided mini flash lights and browsed the menus. As with the restaurant setting, we were also excited by the cocktail menu. The first page setting their ground rules, removing the wanky gimmicks ie. no mason jars, no cotton candy, no mention of the word ‘prohibition’ and more importantly no cocktails with more ice than alcohol, so you are guaranteed for a stiff drink. This list will not disappoint, making it almost impossible to select. The ‘sang som salted caramel whisky sour’ was a clear standout. The ‘mademoiselle chang’s fix’ was an interesting blend of tea, banana liqueur, passion fruit egg white and rose bud, which works perfectly. They certainly nail the whisky cocktails and ‘the Namsaah Libre’, served out of a cola bottle with specialised pink label filled with a concoction of turkey, lime juice, bitters, vanilla and coca cola was excellent. Food wise, the menu is a Thai fusion and perfect for sharing. The salmon tartare in crisp wonton skin taco’s with a bit of Asian flare with flavour combinations, not too different to the Mexican origin of tacos. The favourite starter were the momos, bite sized steamed wagyu beef dumpling with a Thai flavour infused through a sweet pepper sauce. The yellow fin tuna ceviche marinated in coconut milk with green chilli was a nice fresh and light starter. For the mains we shared some beautifully cooked roast duck served with a sweet chilli with a touch of curry flavour, this dish is definitely recommended. Not something we would usually order was the black pepper tofu. but we are glad we did. This dish was not lacking in flavour and had plenty of spice. The texture of the tofu was sumptuous and we were glad our choice of something different was rewarded with this tasty meal. 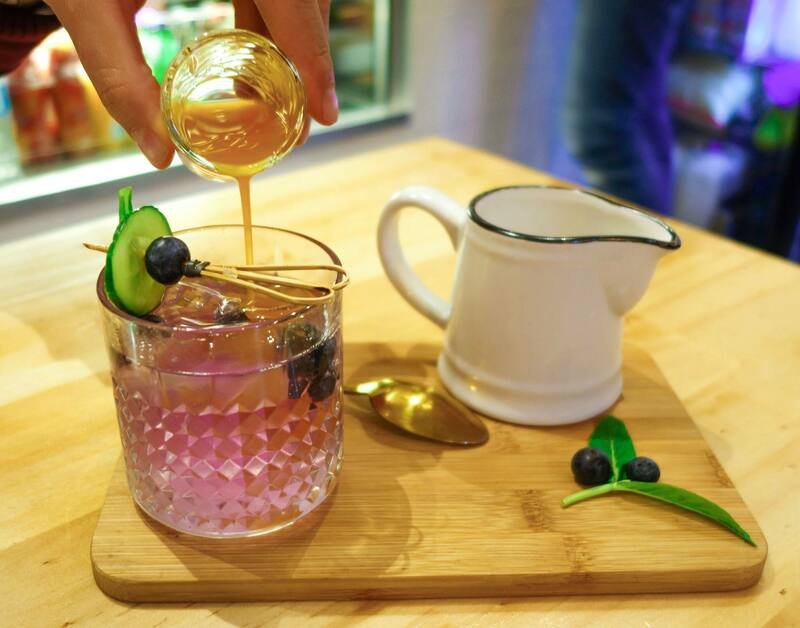 This place is a must visit if in Bangkok, it ticks all the boxes; Namsaah Bottling trust is interesting and exciting, combining good food with even better cocktails a great atmosphere and a decor that will have you thinking you are Alice in wonderland or in a Dr Seuss book. Very well done! Naked brew in Erskinville is just across from Erko oval, a place that conjures up memories of playing football over a rock hard cricket pitch in the centre of the oval. The place has changed alot over the years. Thankfully, Naked Brew is way softer than my memories of the oval. This dog friendly cafe with outdoor seating and clean modern interior is very inviting. 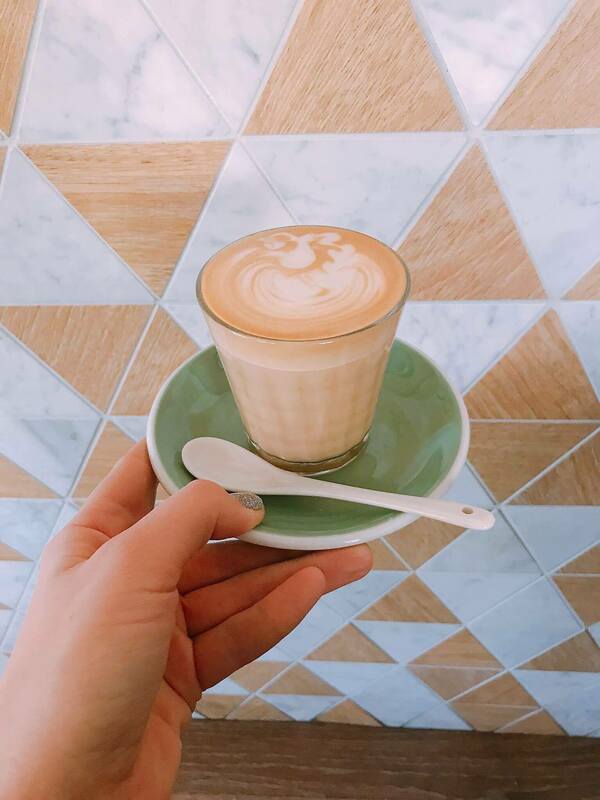 There was a range of interesting menu options and they serve coffee from one of our favourite coffee roasters, Five Senses, who are based in Melbourne. The latte was good, as was expected with that brew and their latte art is on point. 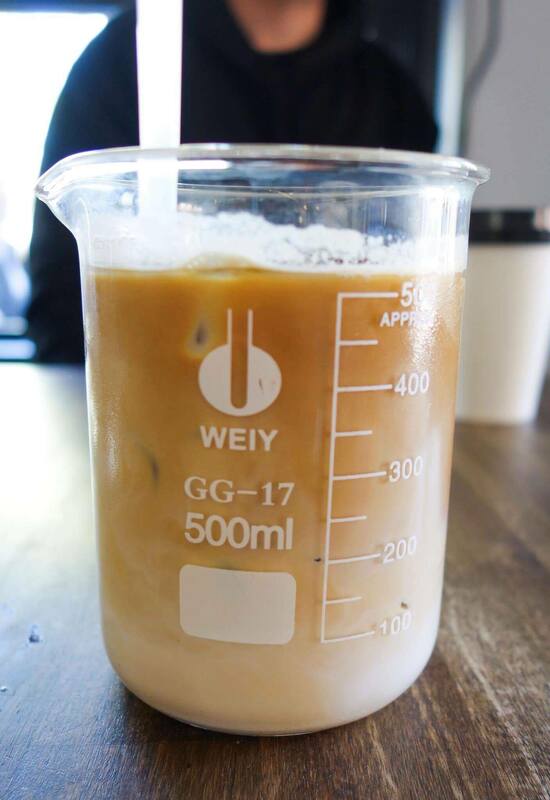 If popping in on a hot day like we did, the iced coffee is a great option, the iced coffee with ice cream will encourage some drink envy from your brunch companion. What, spag bowl for breakfast? Absolutely! 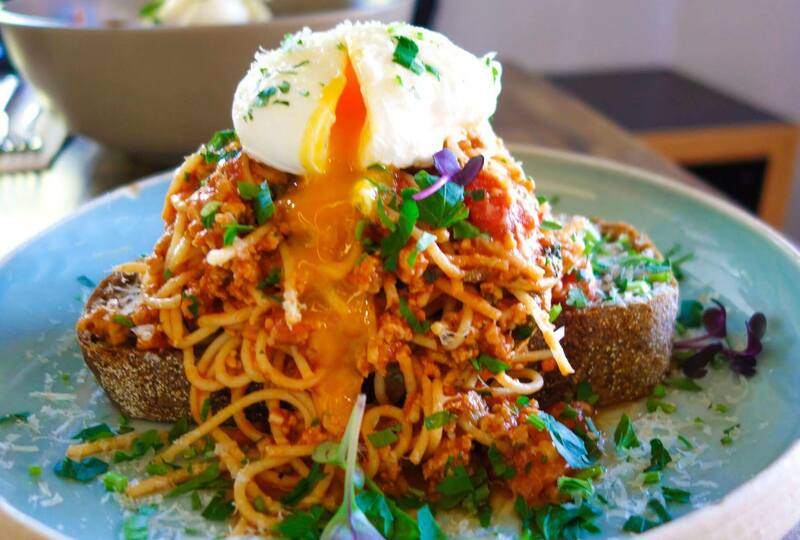 The bolognese on top of sour dough with a perfectly poached egg on top is great if you are super hungry. 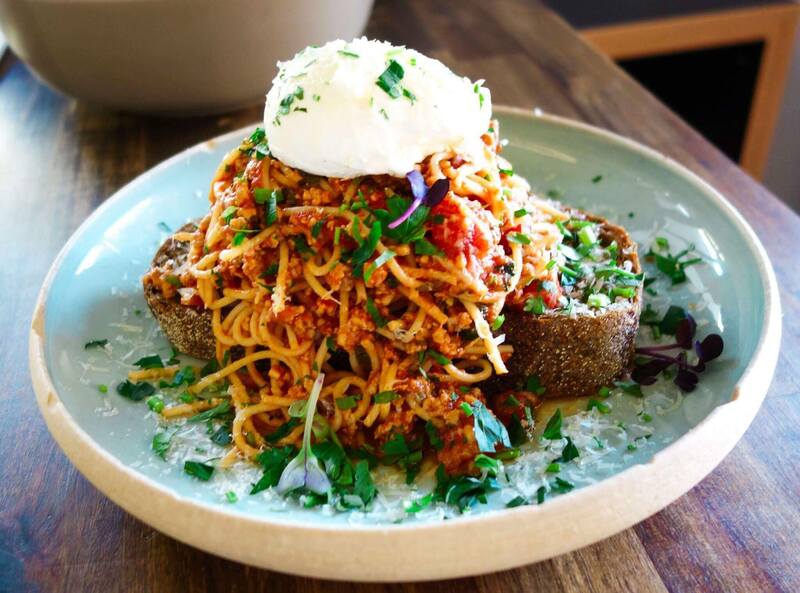 A thick cut piece of super fresh sourdough soaking up that saucy goodness, a mountain of pasta, pierce the egg and have the yolk cascade down. 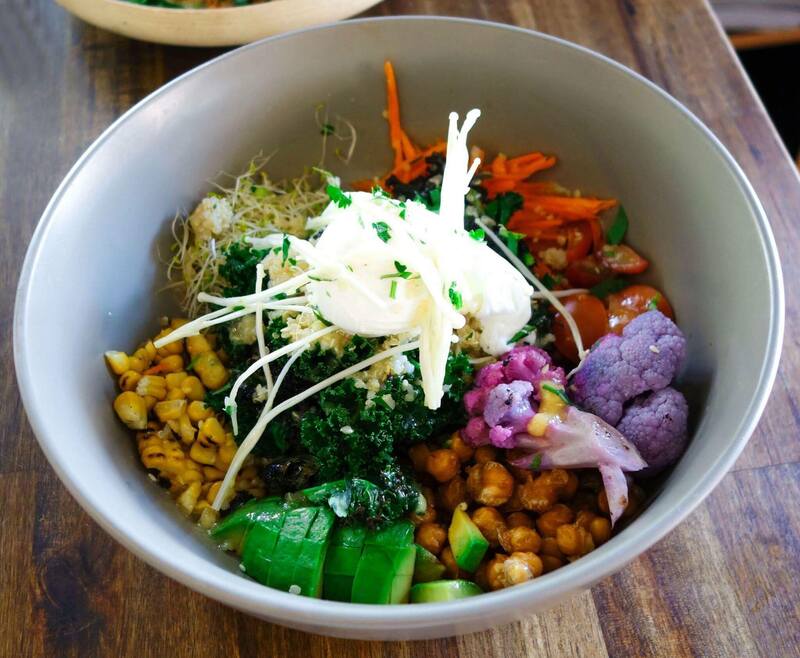 Something healthy as a counter was the goodness bowl. Presented with plenty of colour and a decent portion size. This dish will provide you with the nourishment you probably now need. Loaded with plenty of healthy veg including; kale, corn purple cauliflower carrot, sprouts, chickpead, throw in some avo, tomato and a poached egg on top. Apple crumble brioche toast, waffles and chicken, soft shell crab or black pudding. If you want to try something interesting, this is the place for it.For the dog owners out there, you can take your pup and they sell puppy treats, biscuits and donuts, smoothies and frothocinos! They are certainly well looked after. 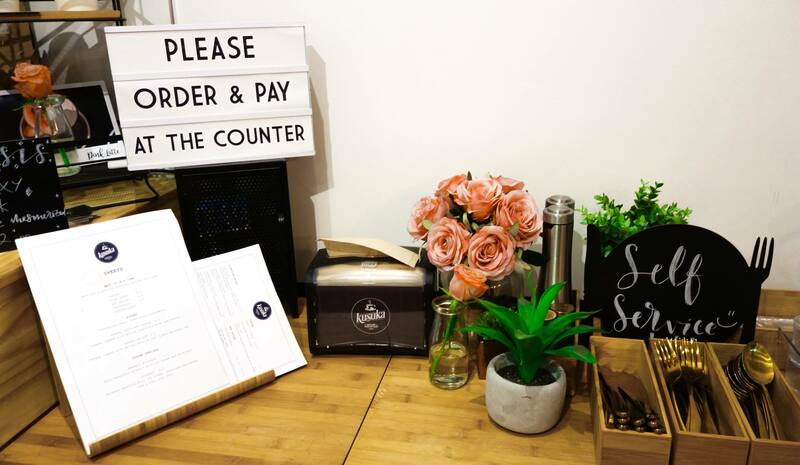 A trendy little dog friendly cafe in the leafy part of Erskineville. 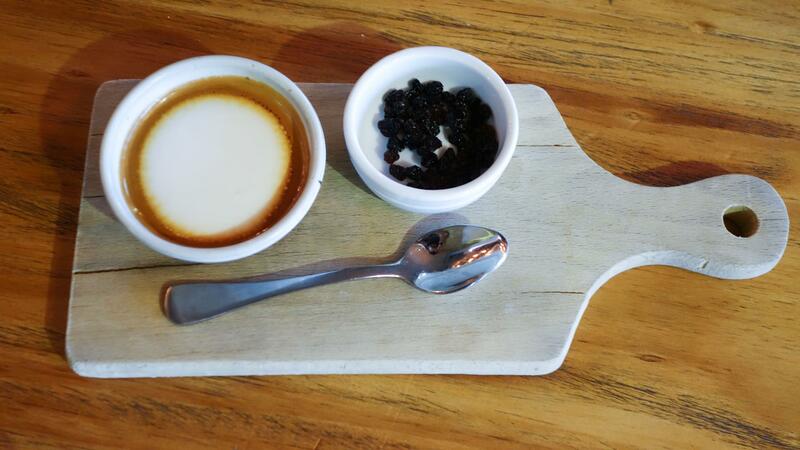 Great coffee and an interesting menu, we will return to sample more of the menu. 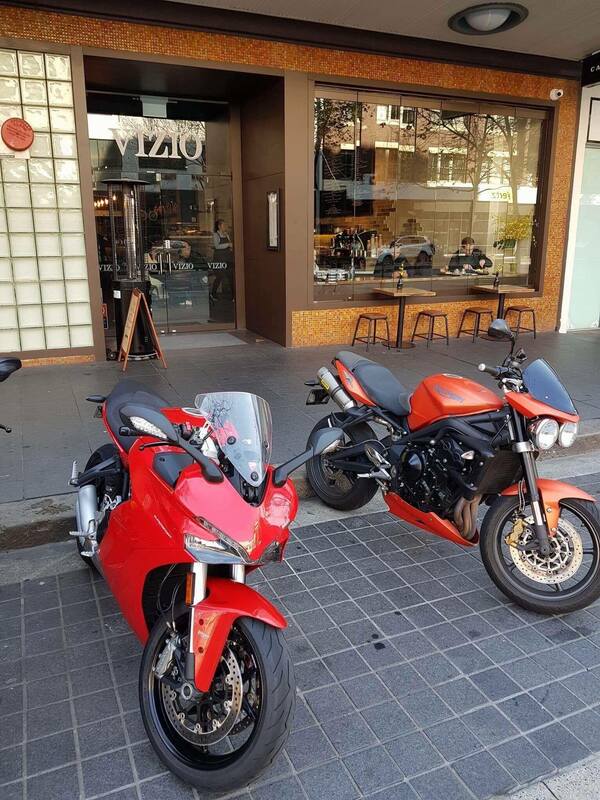 Vizio is a chic cafe situated downhill from the Kings Cross towards Hyde Park on the right side of the road. It is easy to spot, just look for a bunch of motorbikes parked out the front, it is next door to a motorcycle dealer. This cafe is also a restaurant at night. As you enter to the right is the coffee machine and a range of sweet options and cakes if you are in a hurry. It is recommended to sit in enjoy the slick modern fit out and order from the menu. I was lucky enough to get a call up from our instafoodie friend Where_do_I_eat_pete. We started with a couple of coffees as it was a Saturday and we were in need of that caffeine fix. 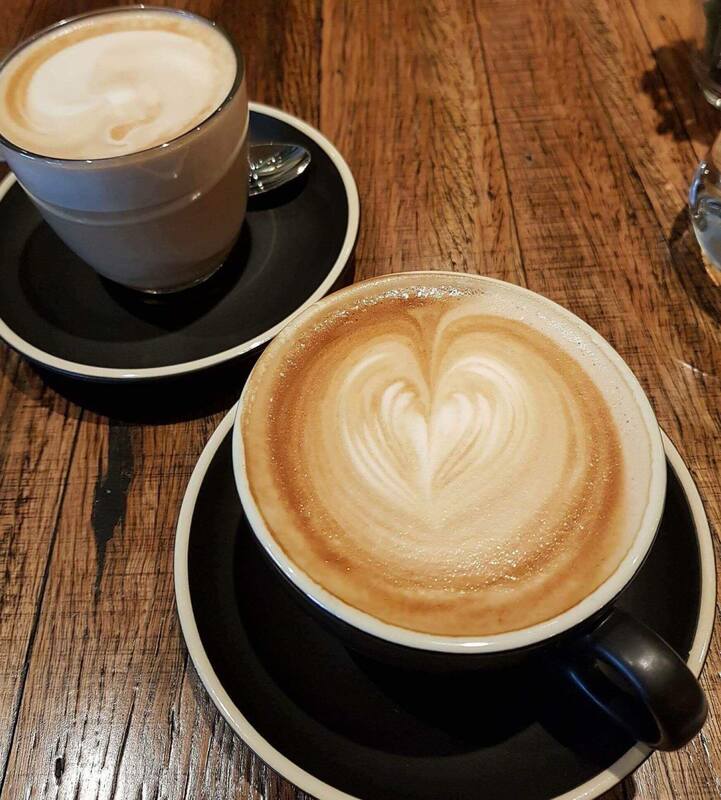 The milk based coffee did the trick, with a latte for myself and a flat white for Pete. After a bit of deliberation on what to order, the crab Benedict was pretty much self chosen. 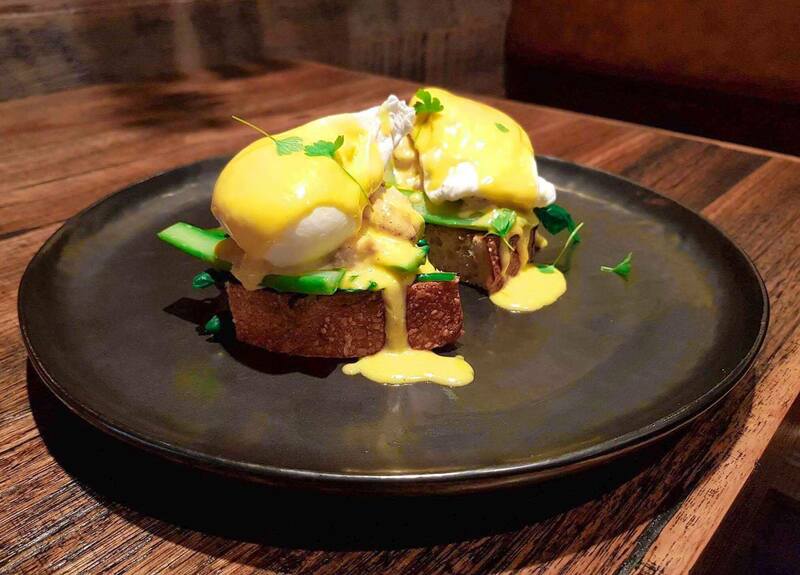 A beautifully presented egg dish, with that rich pastel yellow benedict sauce smothered on top of the poached eggs, beneath the spanner crab meat and asparagus adding a subtle sweetness and flavour of the sea. This served on top of a thick piece of sourdough. This dish is a must order if visiting Vizio. Both having done a bit of exercise that morning, we decided to share the Earthy Green Bowl, which are all the rage these days. 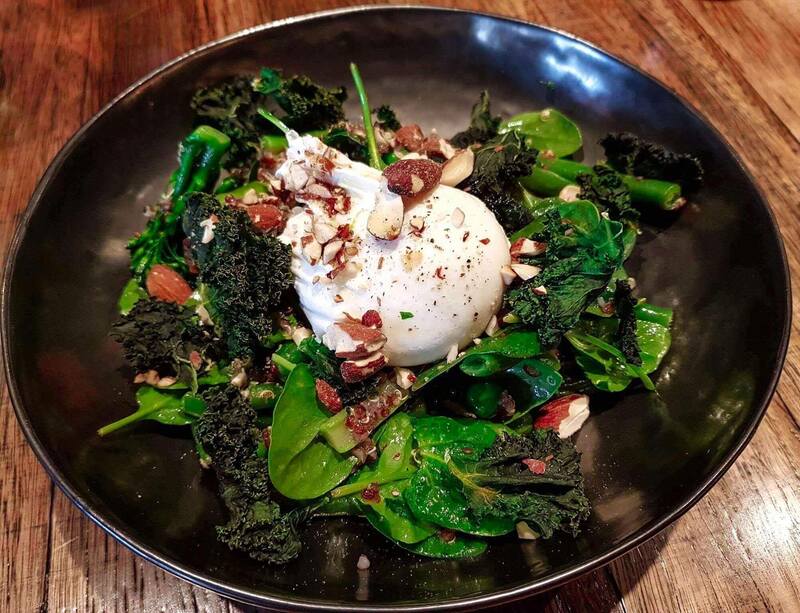 With the usual suspects making an appearance including the kale chips, baby spinach a poached egg and some broccolini, which was nicely cooked and tooped with ginger and crushed almonds for added flavour and texture. This dish certainly looked and tasted healthy. 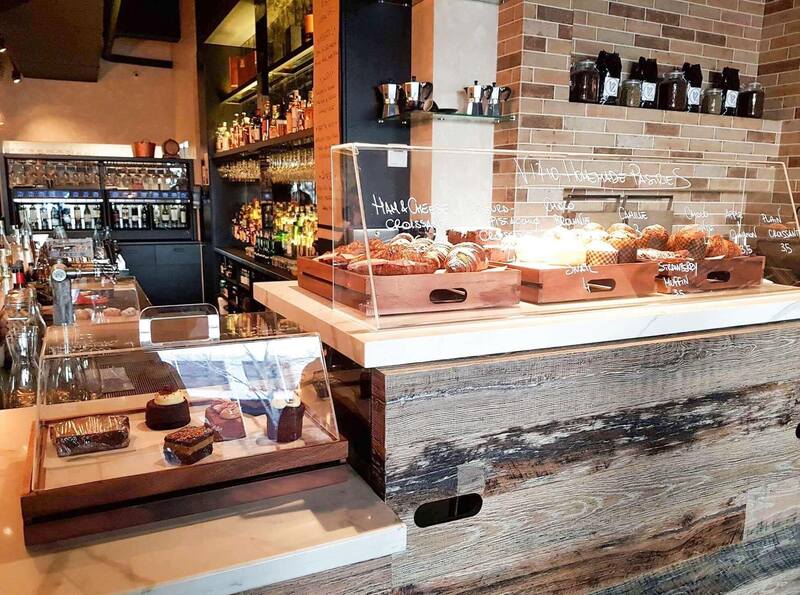 Vizio is a sophisticated sleek cafe serving quality coffee and a reasonably priced breakfast. Taste Tours are a social enterprise who run cultural food tours to provide work for refugees and a multicultural education for the community. 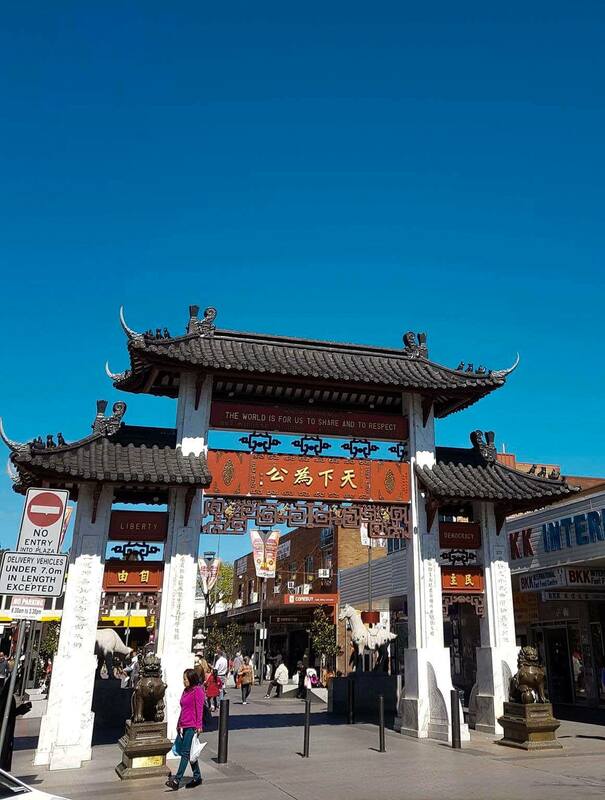 We thoroughly enjoyed our last Taste Tour of Merrylands and we were thrilled to get a call up for the Taste Tour delights tour of Cabramatta, or ‘Cabra’ to the people who live in the area. 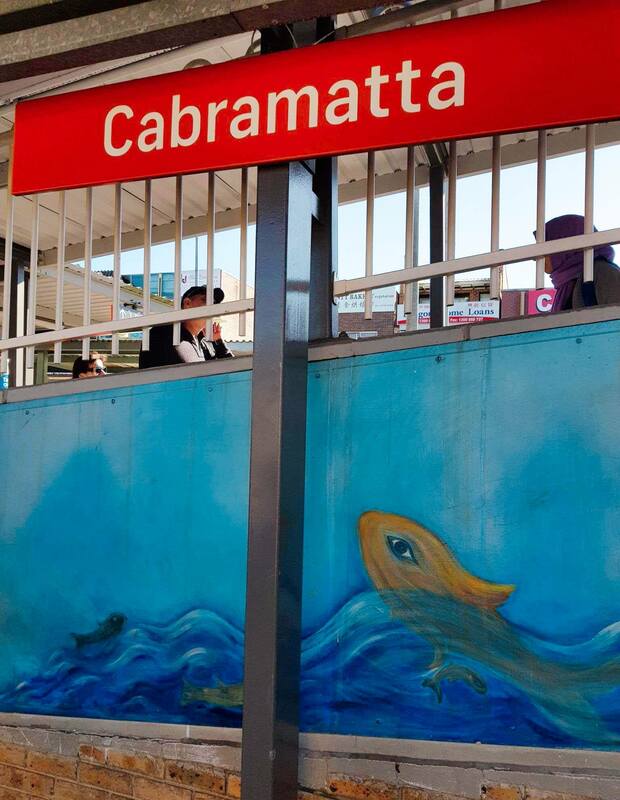 The tour fittingly started by acknowledging the true locals; the Cabrogal people of the Eora Nation, also how Cabramatta got its name. 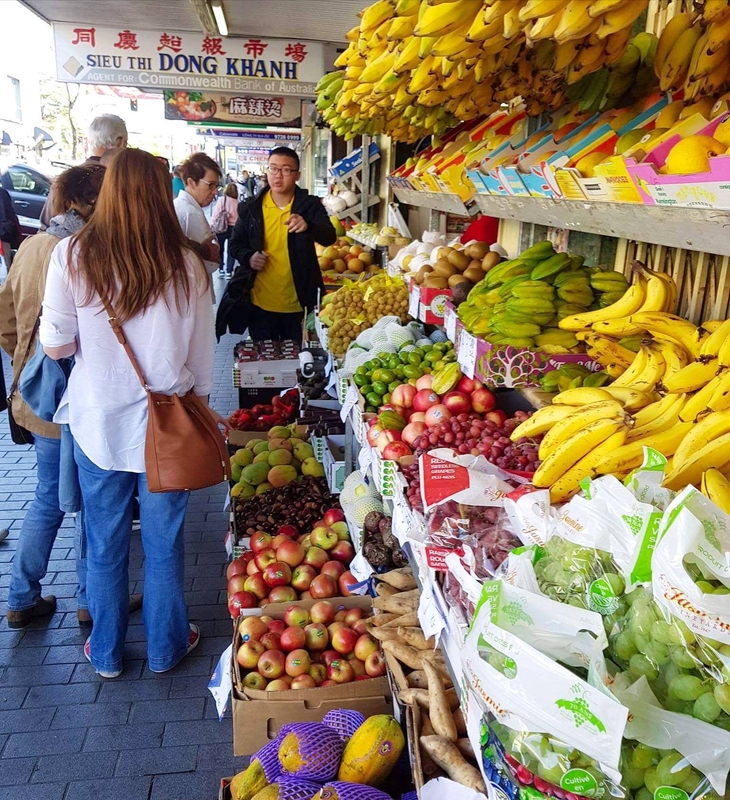 The area has changed alot over the years and is very ethnically diverse, with many new migrants who have arrived over the years calling Cabra home. The Greeks, Italians, Serbians and the majority of the population these days being Vietnamese, with Syrians and Sudanese newcomers to the area. Our guides for this tour were Patrick and Waji, Patrick a passionate local running the show and Waji who runs the Harris Park tour assisting on the day. Taste Tours are a great way to explore new areas, find out about the history and find the best spots to eat. For some added fun, there was a treasure hunt for us to pick up specific items along the way such as peking duck, peking duck pancake, spring onion and hoi sin sauce. 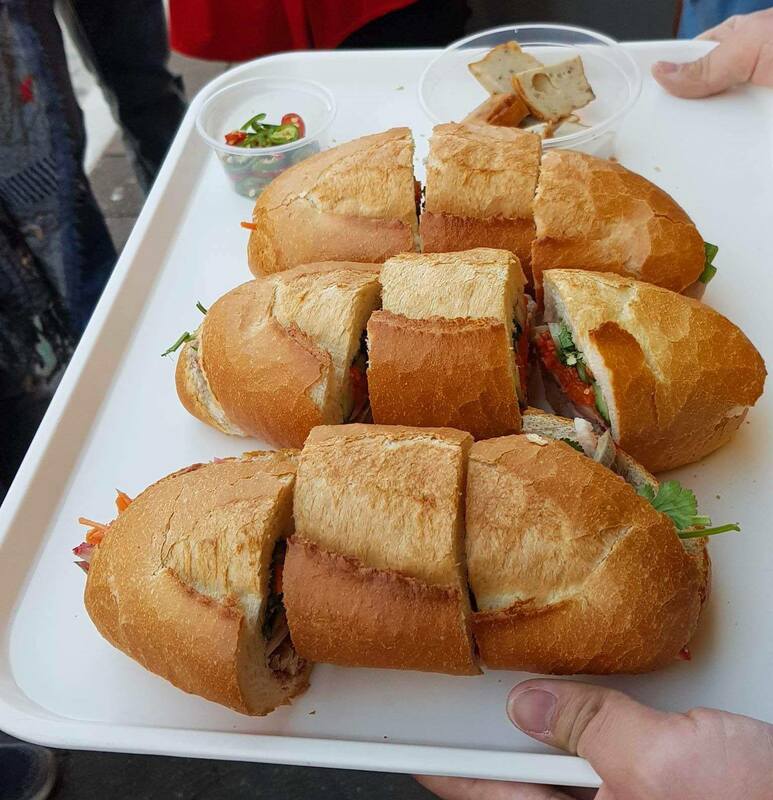 The meeting point was Vinatas Bakery, renowned for their Banh Mi, a Vietnamese style baguette which originates from the French, who once occupied the country. I barely recognised the shop as it has had a fresh makeover, done very well and looks very inviting. The Banh Mi are just as good as ever and still great value. We shared the Pork roll with two types of viet ham, fresh salad, herbs, pate and sauce. Simple and delicious, this place is a must if you are in the area. 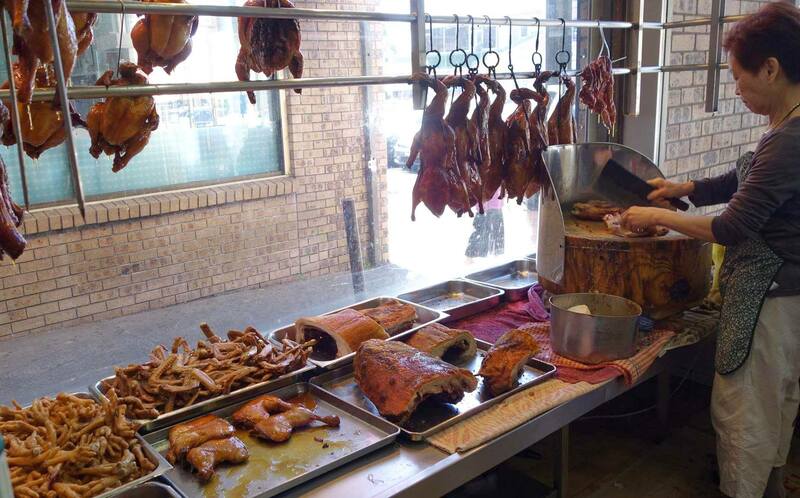 We were led through the busy streets and ended up in an obscure lane way at Tan hong phat BBQ. It has an open shopfront where you can see them preparing the meat by a butcher as well as preparing, cooking and serving. They have some amazing Pork char sui and other BBQ meat on offer. 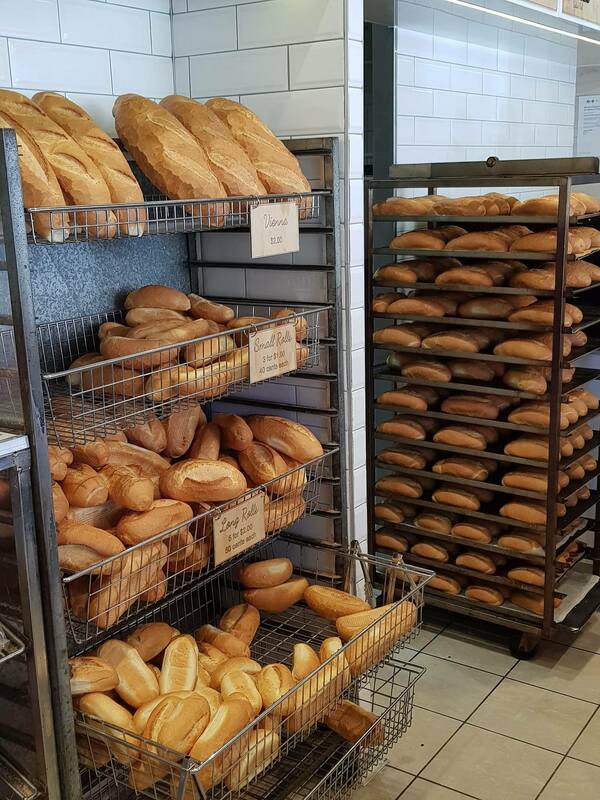 With so much variety, next stop is Sabaidee Kitchen. Serving Lao Thai food where some sweets from the region are sampled. 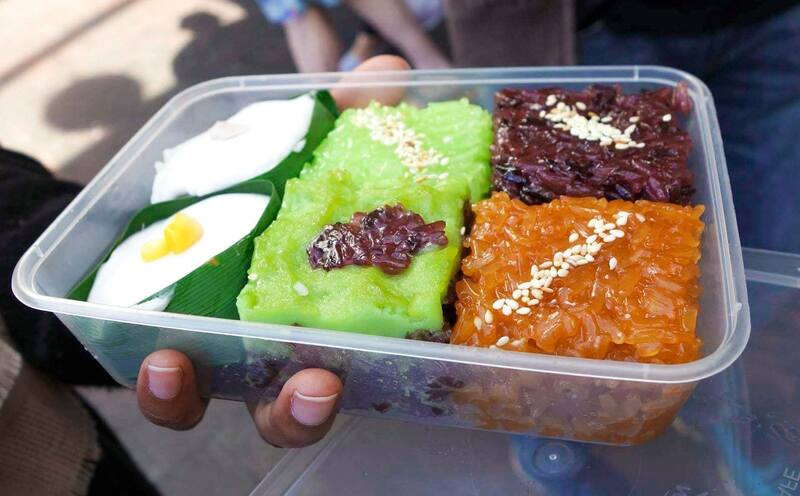 The sweets use traditional ingredients; Taro cocont milk, sticky rice with pandan. Very unique, vibrant and beautifully prepared. 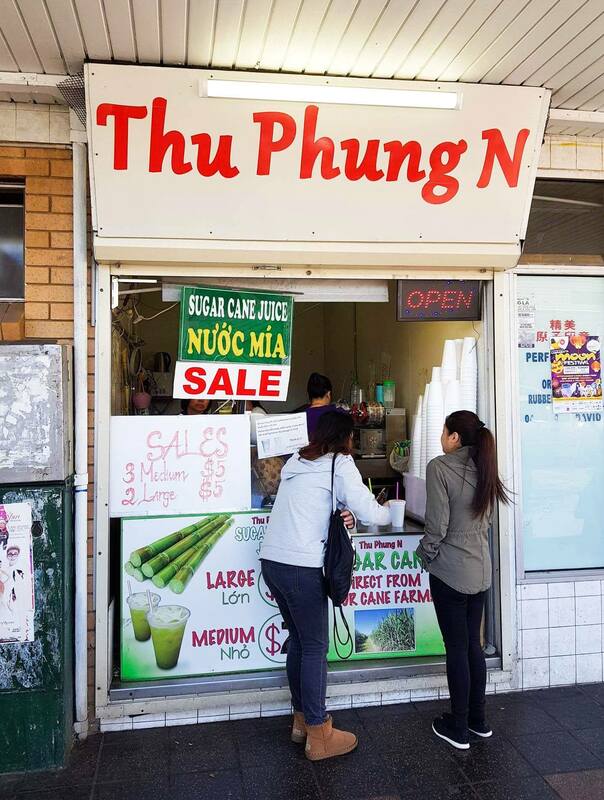 Located in between Freedom Plaza and BKK shopping centre is Thu Phung N. This place is a local favourite serving sugar cane juice, they also add cumquat for added flavour. 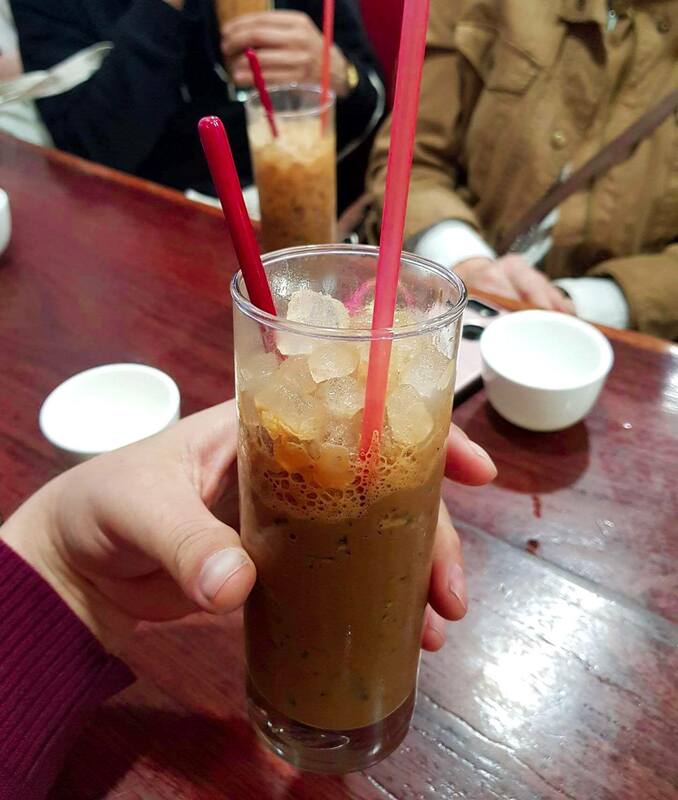 Great to sip on while strolling the streets. 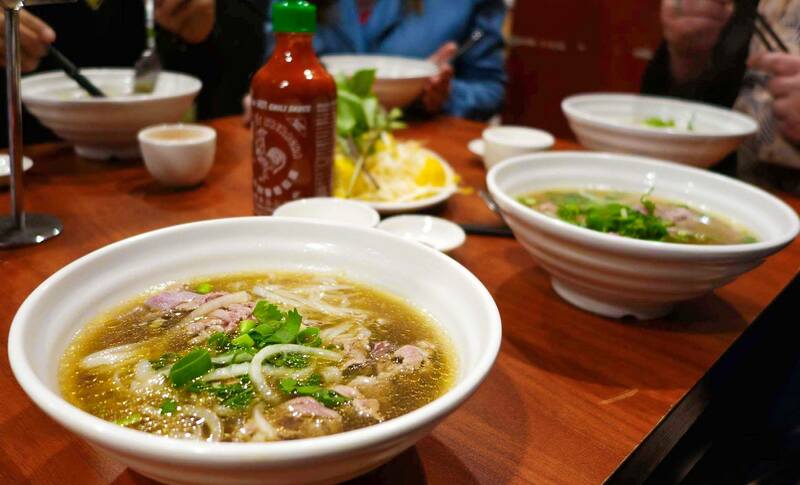 It wouldn’t be right to visit Cabra and not sample some Pho, popping in to Huong xua, who serve a Northern Vietnam style pho. With a hearty full flavoured broth, not as delicate and sweet as the Southern style, but damn delicious and cheap too. Having tried a range of food it was time to give our bellies a rest and to see where the ingredients are sourced. We stop into an asian supermarket, this is where many of the ingredients of the treasure hunt are found, along with some other exciting ingredients not to be found at your local super market. 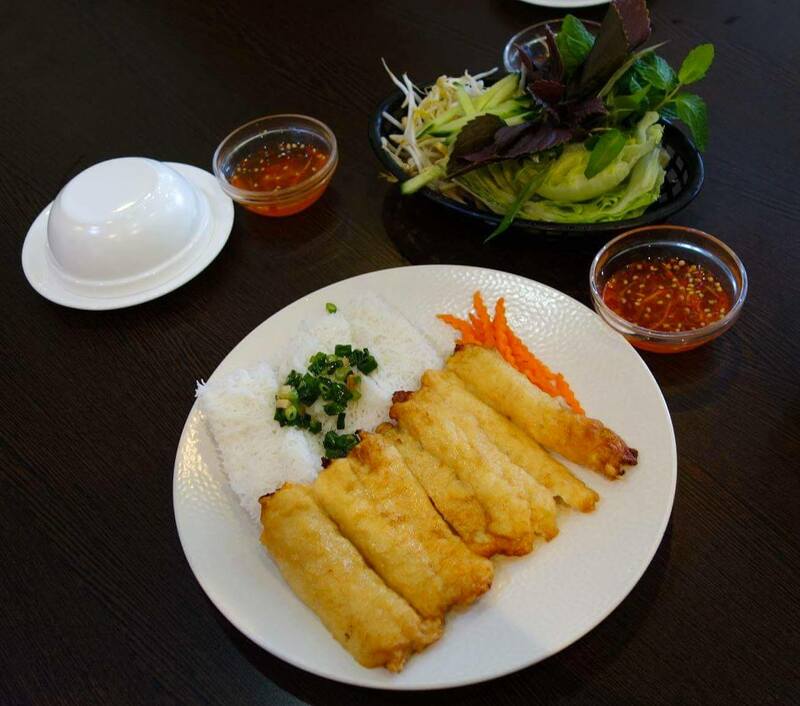 Back to the delicious food and we are stepping into the restaurant Thanh Bihn. 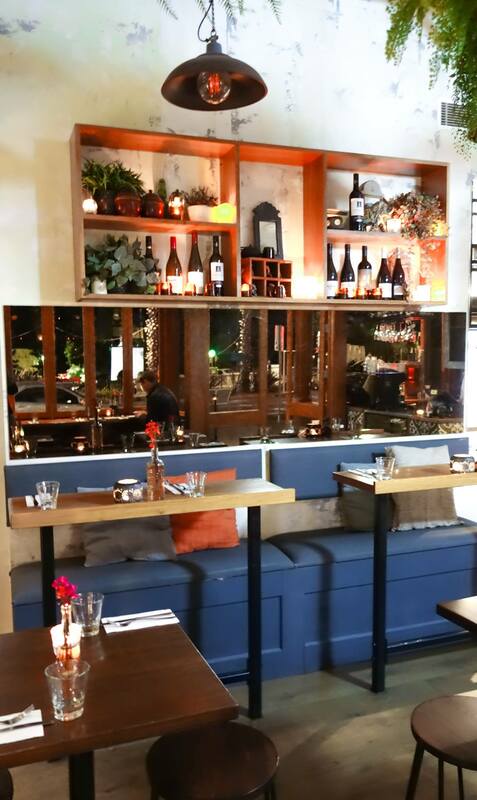 This restaurant was established by the mother of celebrity chef Dan Hong. 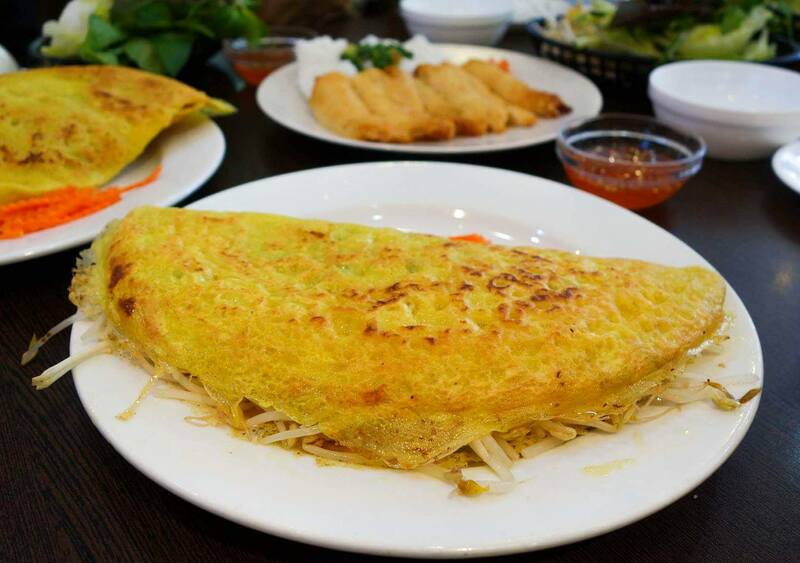 A southern Viet restaurant, we sampled some staples being the bahn xeo, a savoury a thin crisp crepe/pancake filled with bean sprouts carrot, chicken and spices. The highlight of this visit was the roll your own rice paper rolls with sugarcane prawn. This was not because of my awesome assembly skills (which, it turns out, aren’t so awesome) but because the sugarcane prawns were outstanding. Finishing the tour on a high, could have something to do with the super strong Iced coffee being served at local gathering spot cafe Nho. This place was very busy but they managed to squeeze us in. Perfect spot for sharing our highlights of the tour. We loved our taste tour experience, their guides are passionate and love their local area. They also take you to some great places to eat. A great way to explore a new area and expand your horizons. You will learn a lot and have an enjoyable day. We recommend you make a booking. 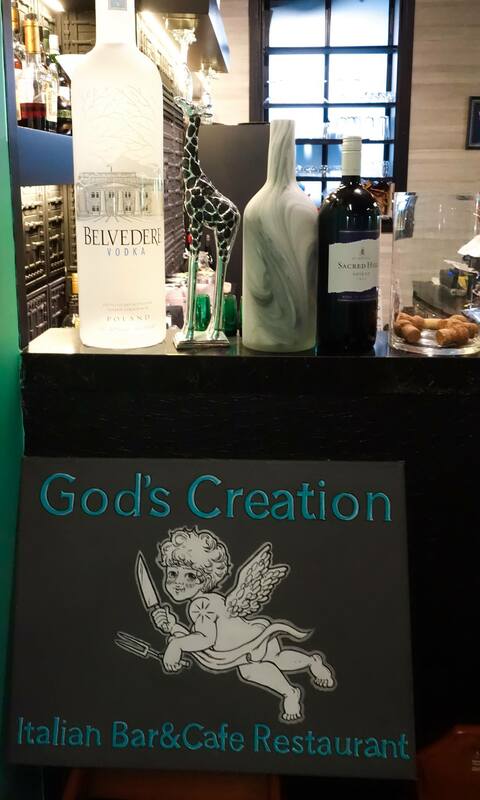 God’s Creation is a new café on Darling Street Balmain. 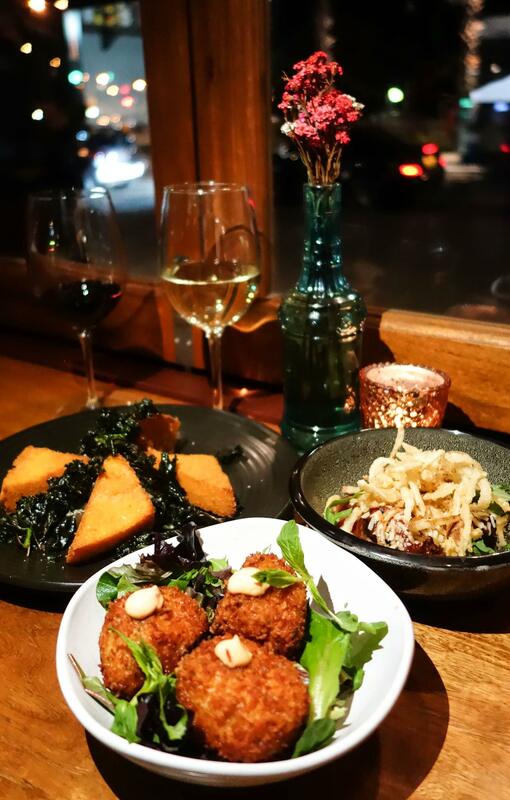 Whilst Balmain is a place that is spoilt for choice, with so many cafés and restaurants aligning the streets, it’s hard to imagine another restaurant is needed. However, this restaurant is like nothing that exists in the area. It is an Italian restaurant, with an Asian influence, ran by a lovely couple reigning from Hong Kong. The restaurant was easy to spot, in a beautiful heritage style house painted turquoise green, and I love the colour! As soon as we entered, we were met by the beautifully charismatic host, Helen who greeted us with a warm hug and air of excitement about our visit. We enjoyed chatting to her, hearing her story of working and living in Hong Kong and then Australia, with her husband, the chef who has had significant experience in Italian restaurants in Australia. We began with drinks and opted for a few cocktails. 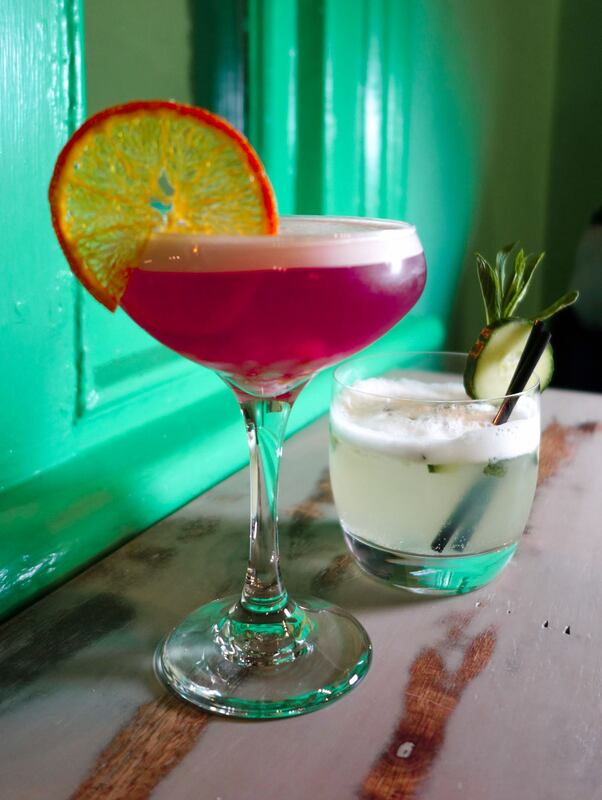 We tried both the sweet pink cocktail, reminiscent of a cosmo, topped with a dried orange and blended nicely. We also tried the cucumber and gin cocktail which was lovely. 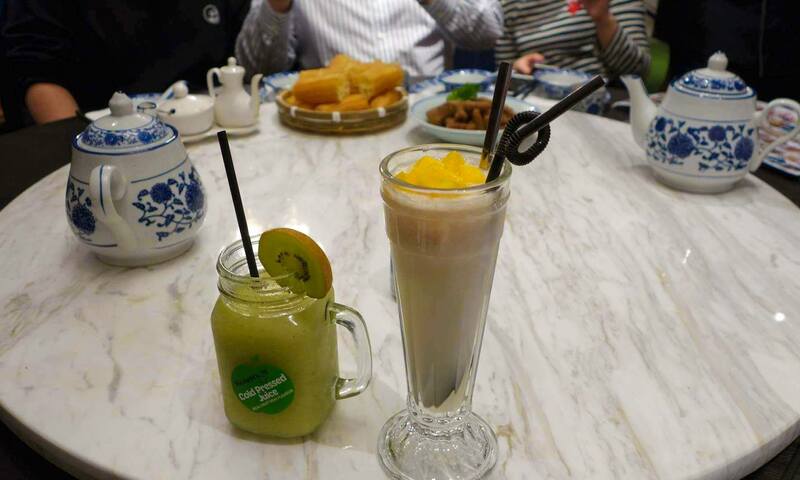 Both a sweet and refreshing start to our dinner. 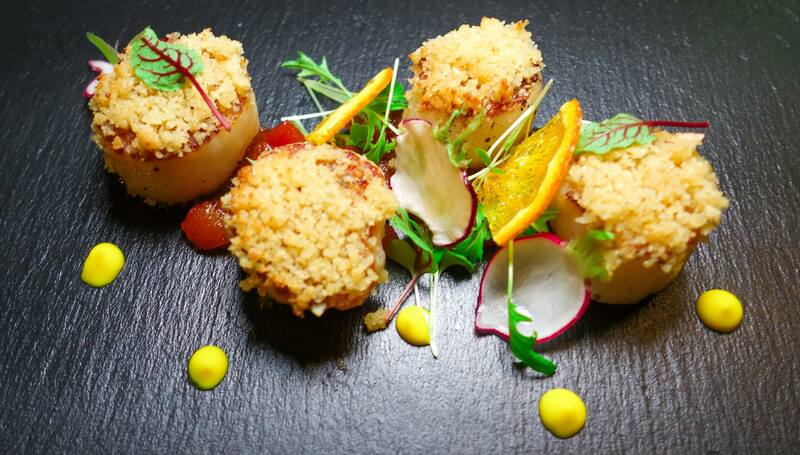 We discussed menu options with Helen and decided on the scallops for entrée – beautifully cooked scallops and presented with a garlic and almond crust and sweet home made tomato sauce. 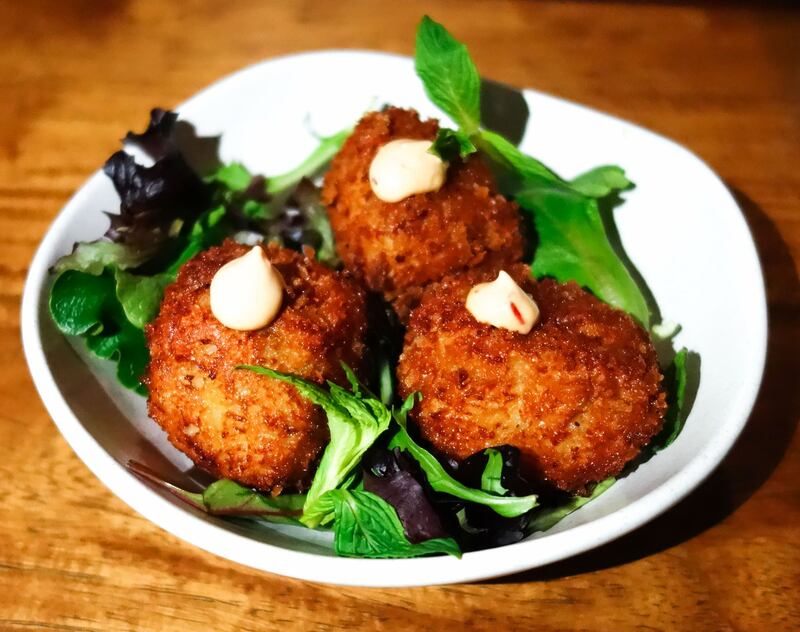 Other choices include calamari, arancini, prosciutto e melon and salads. For the mains, we could not go past the lamb and duck. We were presented with three amazingly cooked cutlets of lamb, crushed with macadamias, sitting atop mashed potato, roasted dried vegetables and a zesty drizzle of sauce. The duck was also divine – cooked to perfection with red wine jus, sauteed onion and what looked like potato, but was infact pineapple. 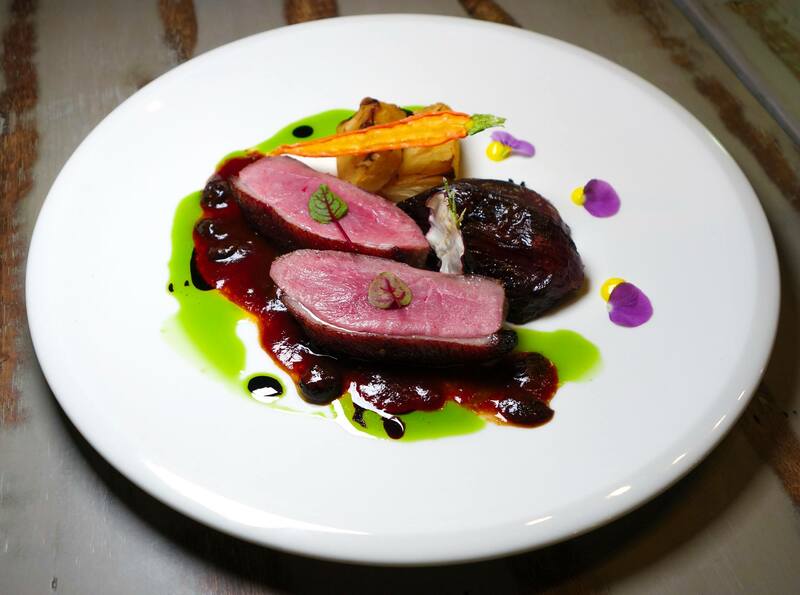 A lovely combination of flavours and the chef is certainly skilled at cooking as well as his plate presentation. There are a good range of seafood dishes, risottos and pastas as well. 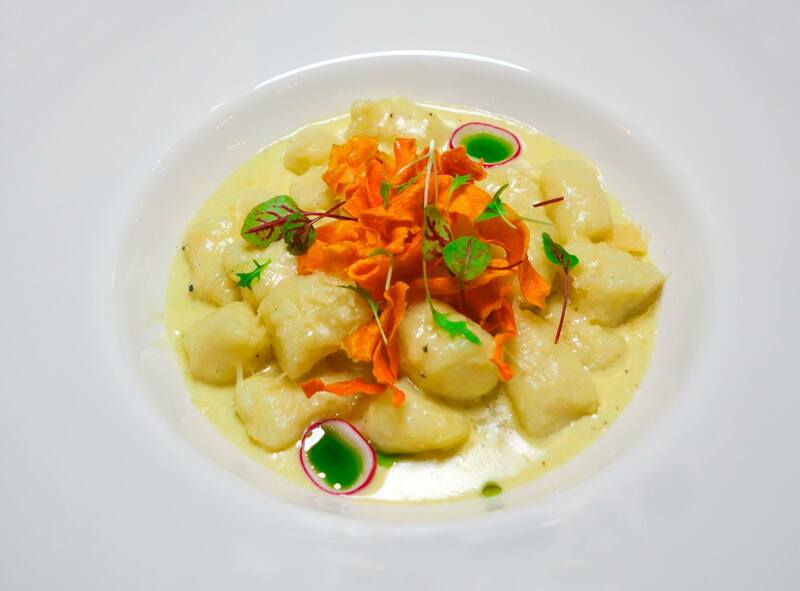 We had to try a pasta too, being at an Italian restaurant and within two seconds of looking at the menu, we knew that had to be the Triple cheese gnocchi (blue, brie, mozarrella and parmesan). Topped with crispy sweet potato and radish. This may not be great for the waistline but is certainly amazing for the heart and mind. We could not fault the food or presentation and it was also a lovely experience. The ambience was wonderful and it was a joy to dine at God’s Creation. However, If you’re after a few drinks and tapas, there’s bar tables and stools outside, and you could order a meat platter, (chacutterie) and some smaller bites. 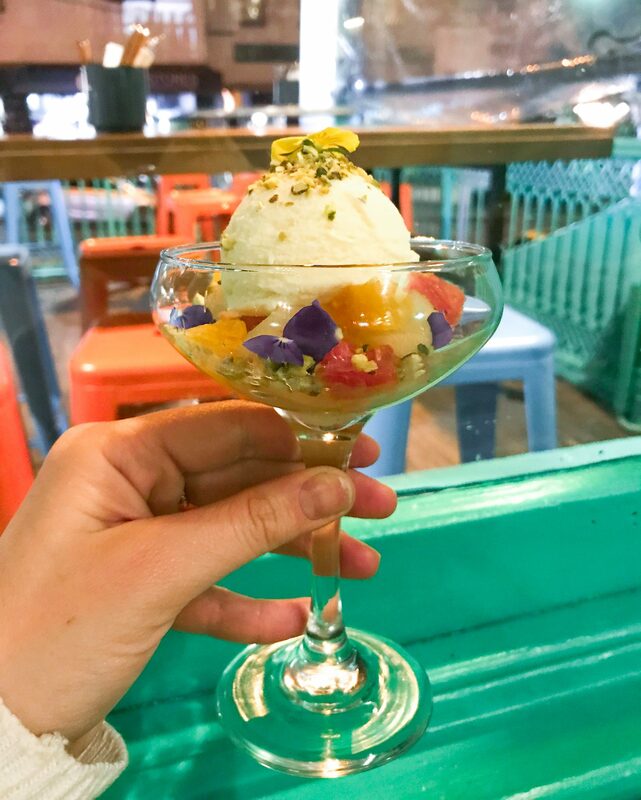 Not to end off the meal without dessert, we were delighted by a small glass of fruit and ice cream, topped with pistachios. Make sure you pop by and check the new kid on the block! Thanks to God’s Creation for the hospitality and food and to Trina from Dr Social for arranging our invite. 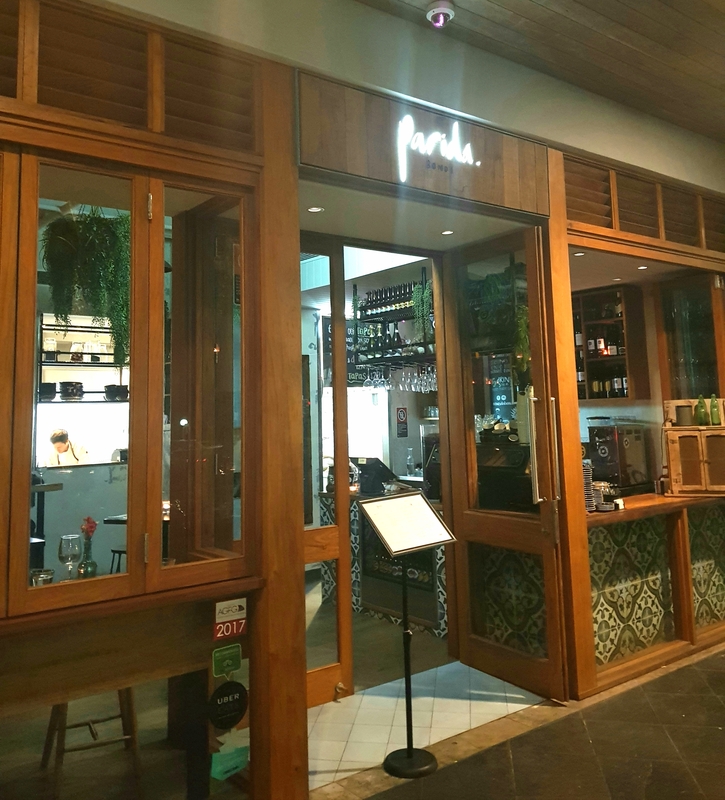 Parida is located on the esplanade at Bondi Beach. It is in a brand new building near the QT hotel and is sophisticated in its set up and styling. It ishe perfect spot for enjoying tapas and wine on a Friday night (or any night for that matter). There are seats overlooking the beach and high tables, set with candles made for a cosy and intimate setting. Parida also sells breakfast and lunch, but on this occasion we were here for the dinner menu. 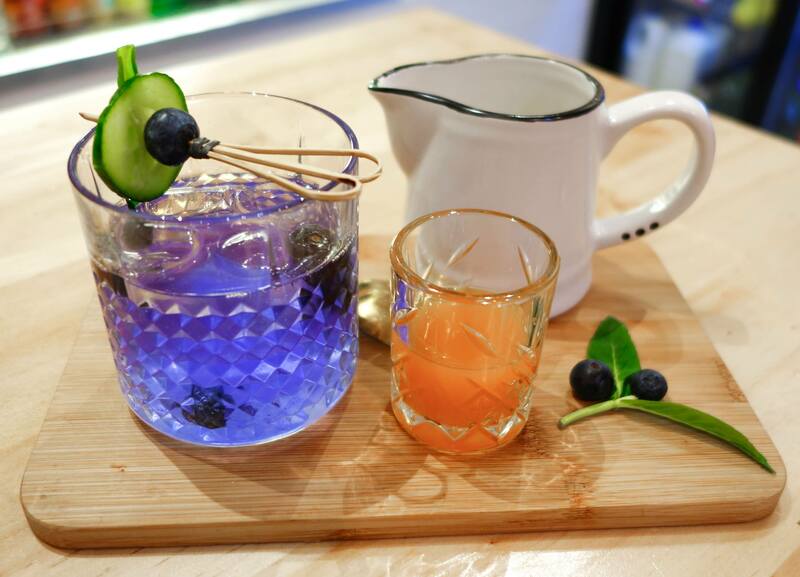 Recently attaining a liquor license means you get to enjoy a drink after work or with your dinner. 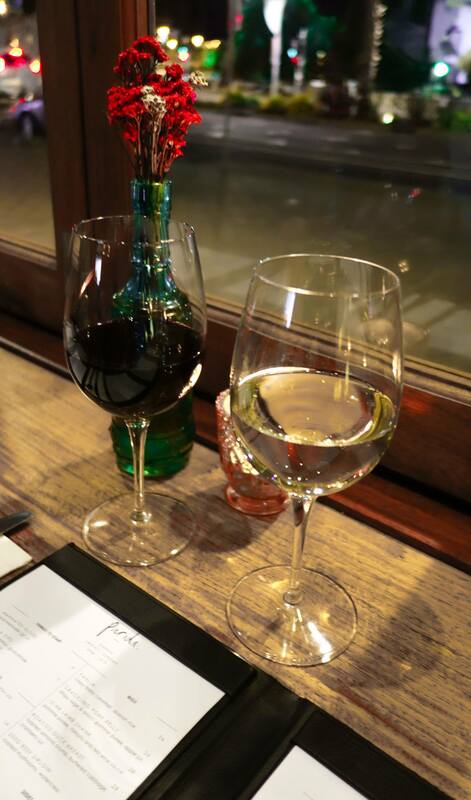 We began with a red and white wine and there’s a good range to select from. 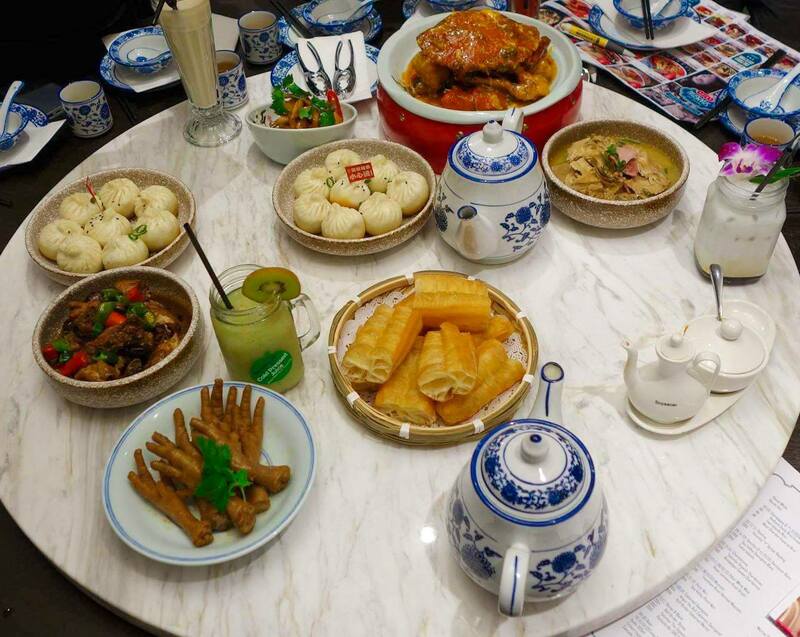 The food is a shared style menu with small and larger plates. 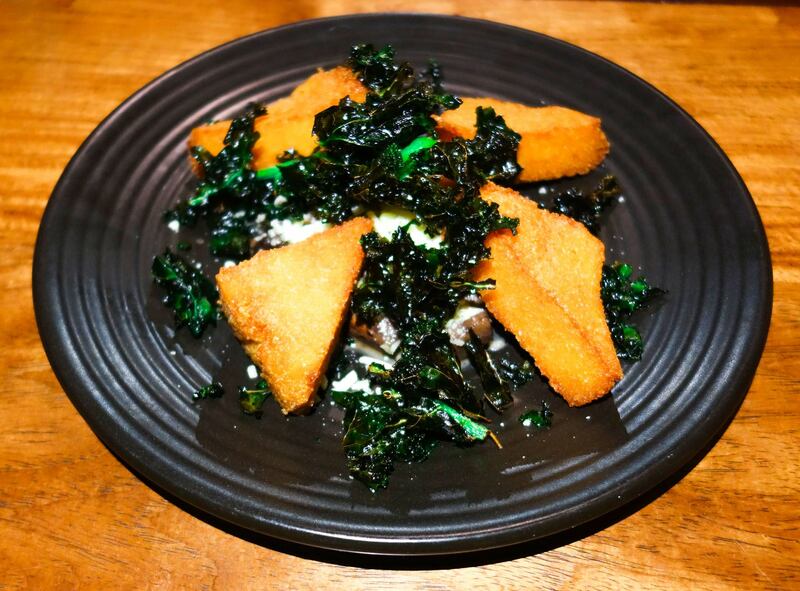 We went for the polenta chips with truffle mushroom and these were nice and crispy and with a nice and strong truffle flavor and kale. The chorizo croquettes were also nice and crispy with and cheesy filling. We loved these and actually compared them to “cheese and bacon” balls (the chips) and I would certainly order these again. The meatballs, filled with cheese, tomato and oregano sauce as well as crispy onion rings. The meat was moist and nicely cooked and the whole combination was very flavoursome. For the larger plate, we struggled to decide what to pick, with a number of great sounding options. We went for the lamb shank to share. This cooking method meant the meat beautifully fell off the bone. It was sitting atop an extremely good and very creamy pomme puree and a tomato puree sauce. We polished all the food off in no time and really enjoyed the food and the ambience, as well the friendly service provided by Frida. Thank you to Frida and Peter for the invitation to dine. 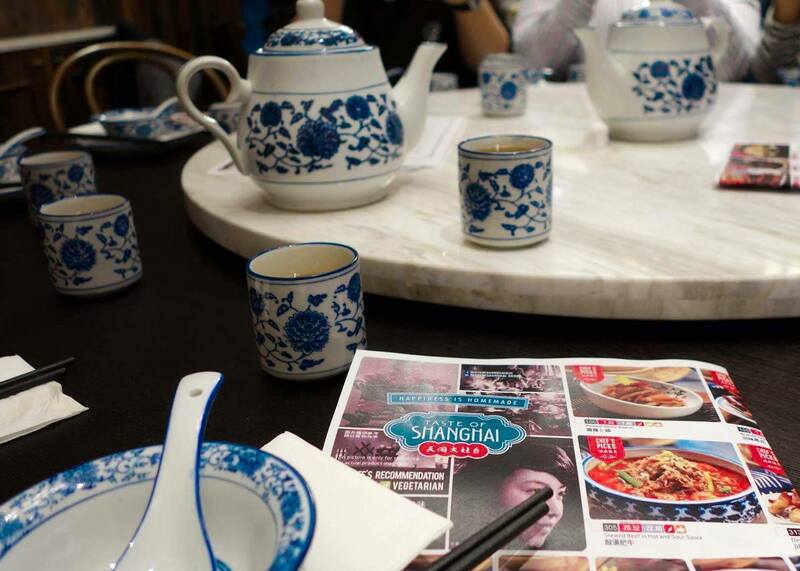 We received an invite to attend a media launch at the shiny new Taste of Shanghai Burwood restaurant. 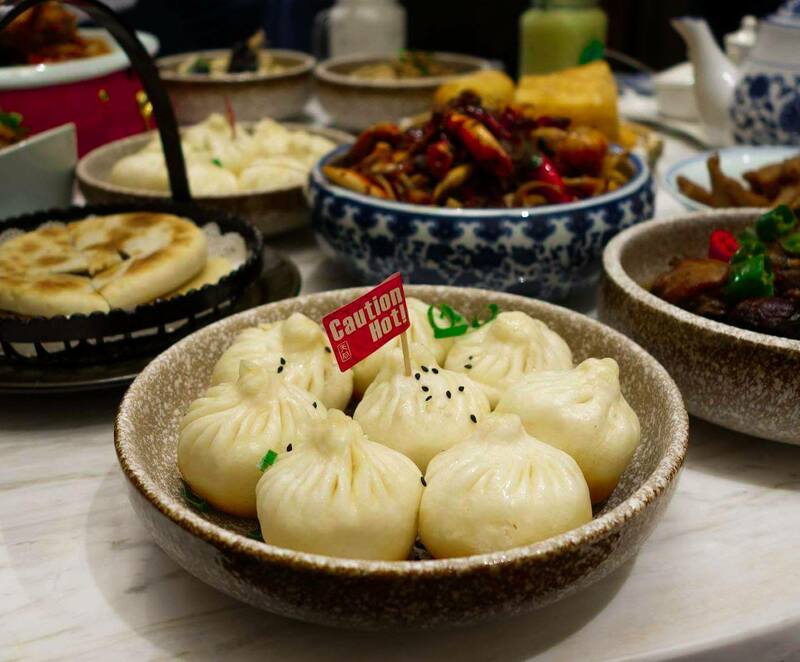 It is a huge space attached to Westfield shopping centre; with a large open kitchen and modern fit out with decorative reference to Shanghai. This new venue is sophisticated and complete with a bar which is right in front of you at the entrance. There is also a private dining room, complete with two large round tables both with an extravagant marble lazy Susan. 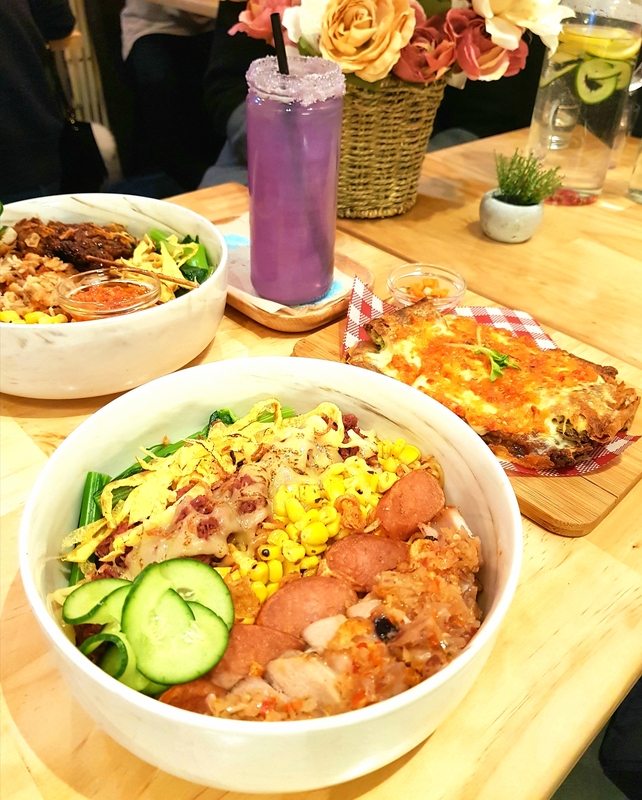 The menu contains many of their standout home style cooking from the other venues and some new options including stews, stone bowls and their Grand Opening Special Chilli Crayfish which alone is worth visiting for. No need to go thirsty with their stocked bar and a range of interesting and the non alcoholic drink options available. Choose your refreshment, be it white wine, red wine, beer, maybe a lychee and mango crush, ice cream milk tea or signature lemon tea. The ordering was left in the hands of our lovely host Amy. The banquet included an amazing selection of food, chosen for all in attendance to share. 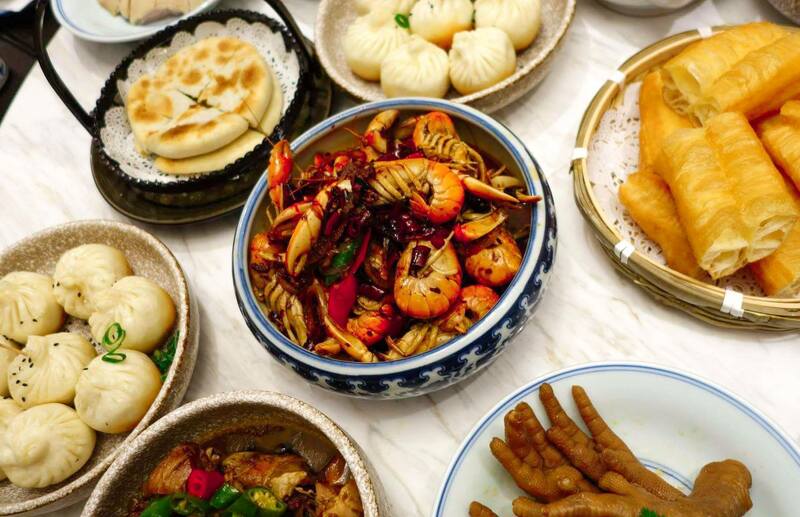 With a number of Shanghainese favourites marching toward the table including pan fried pork buns, sun dried cabbage pancakes and the fried dough sticks awaiting any opportunity to soak up any delicious sauce left over. A line up of the chef’s picks come to rest on the Lazy Susan. 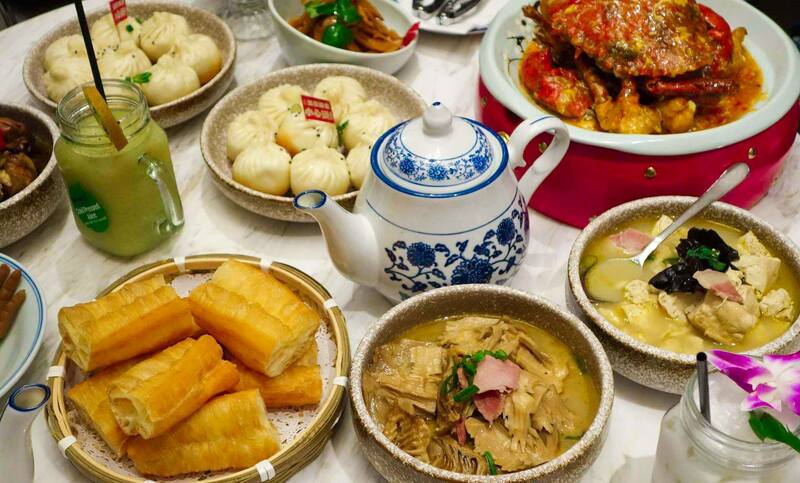 The favourites were creatively presented Barramundi in Lemon sauce, the mud crab in special sauce, braised pork belly as well as the sweet and sour eggplant. Other notables were the stewed tofu with salt pork, pickled white radish and squid ink rice with seafood. It wouldn’t be a banquet with out a sweet finish and lets face it, room can always be spared for mango pancakes. These were particularly good as they were made using fresh mango. No fresh mango, no mango pancakes! This is reflective of all the food being served at this restaurant. Fresh and delicious! Other desserts arrived, including fruit platters and deep fried Chinese milk dough. We loved the fit out and shared a meal in good company. Thank you to Ompty media for allowing us to tag along and to Amy as well as the staff of Taste of Shanghai for their hospitality. 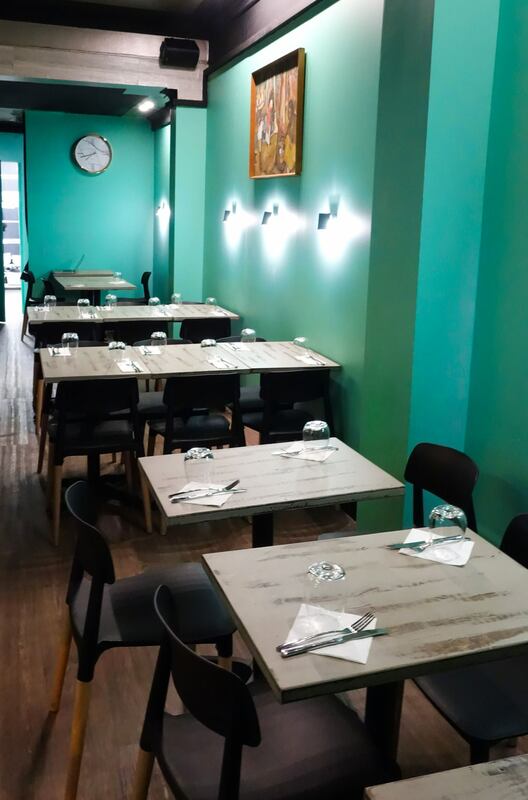 If Ashfield is busy, check out the Burwood location, they have plenty of space to accomodate. Kusuka Cafe is a Warung Kopi (coffee) House. 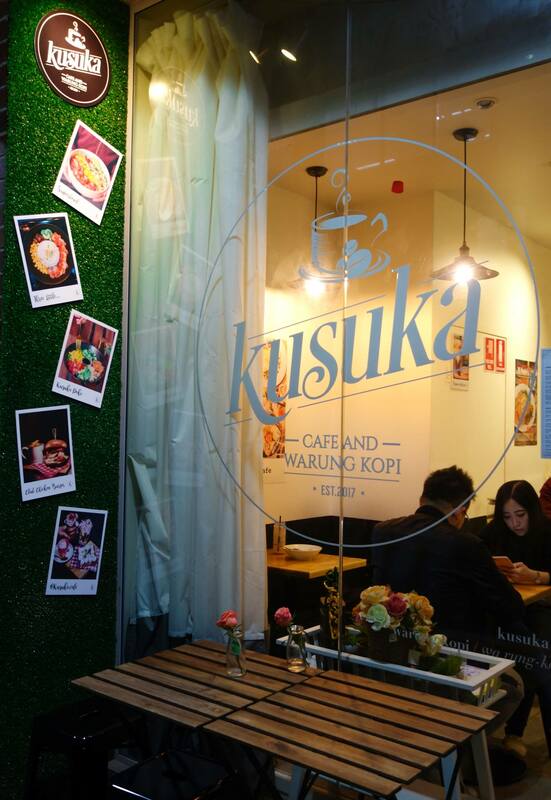 Kusuka translates from Indonesian to ‘I Love’, and we do love Kusuka cafe. So much so, we will certainly return again for more. 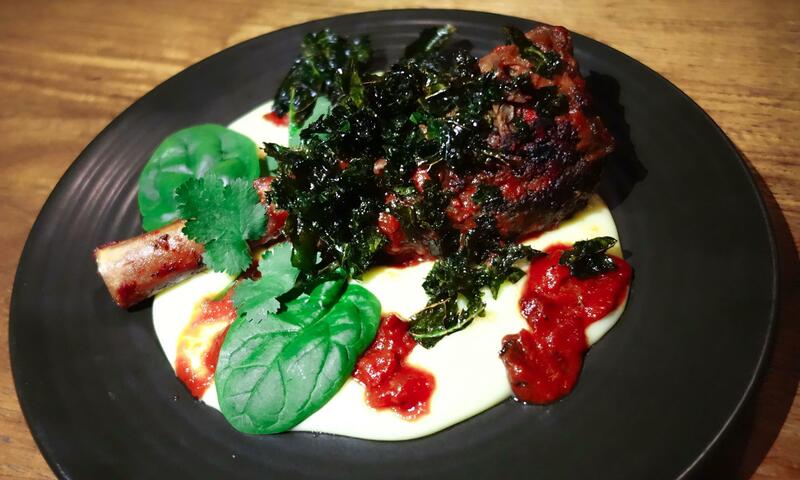 This quaint trendy Indonesian inspired cafe is hidden down a laneway in Haymarket. Despite the conspicuous location, it is a busy little cafe. 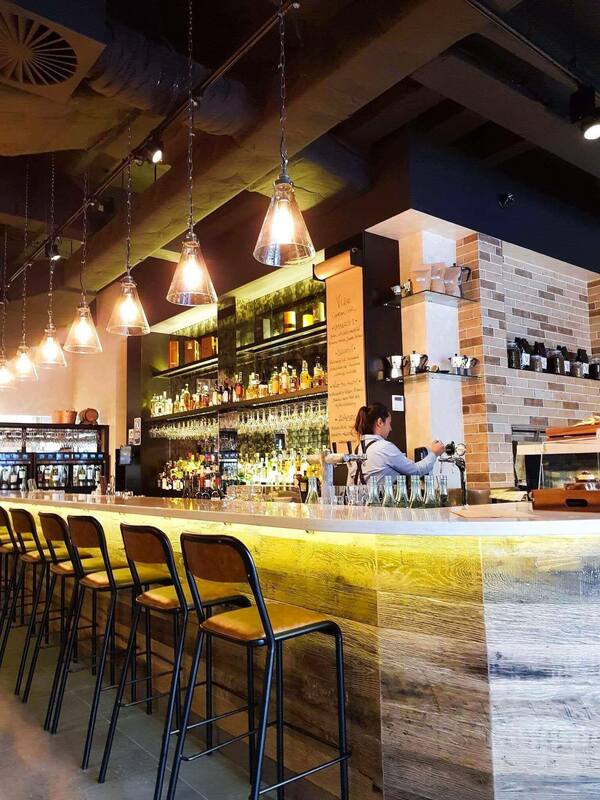 Kusuka is open for breakfast lunch and dinner, serving extremely Instagrammable Indonesian food and drinks. 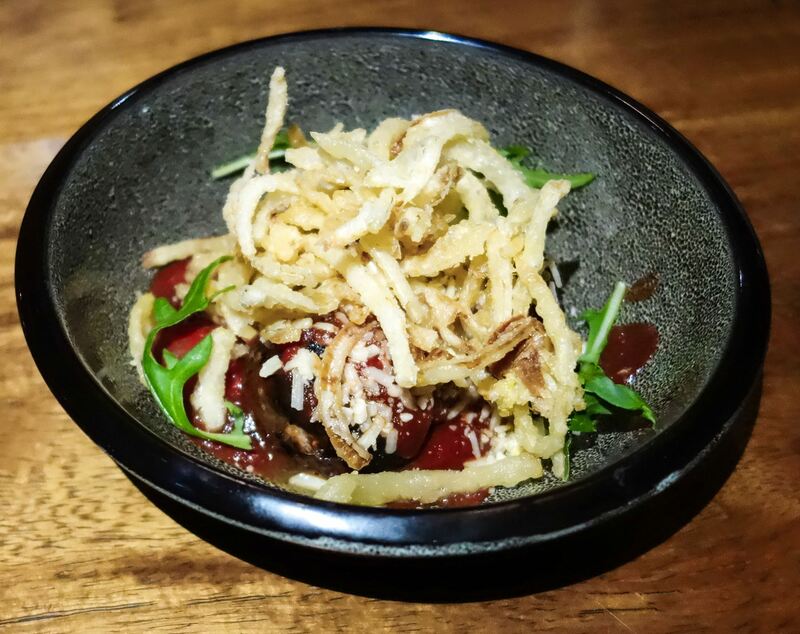 Having seen a number of impressive pictures on Instagram we were excited to receive an invite from Zomato to visit Kusuka. Visiting on a Monday night we found our way using Google maps. We were greeted by the friendly owners Liz and Mario. Provided with not one but two menus, there was a really good amount of choice. The impessive beverage and dessert menu is our instant focus. With a range of Kopi (coffee), different types of colourful lattes, smoothies, dessert shakes, juice, teas and some colour changing drinks. The disco princess is first on our hit list. 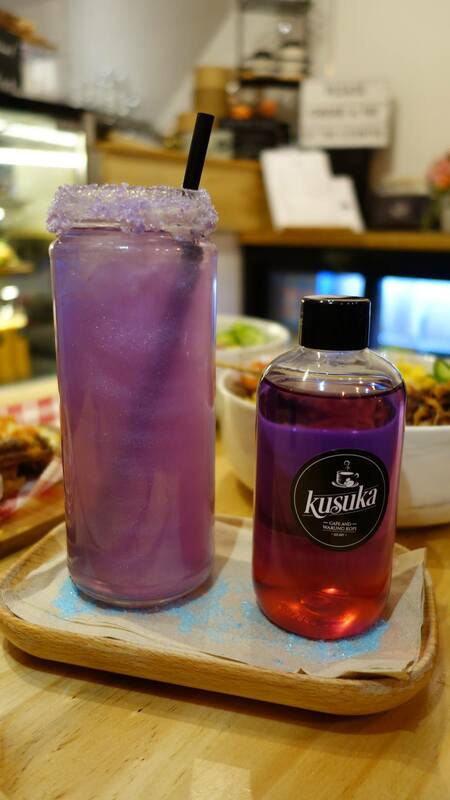 This refreshing lemonade is not your standard lemonade, this drink has more colour changes than the Opera house during Vivid lighting festival. Presented nicely, it starts out a Lavender purple, with a bit of sorcery add some mystery liquid, it then becomes pink in colour, pour in a different serum and it finishes morphing, ready to drink and orange in colour. 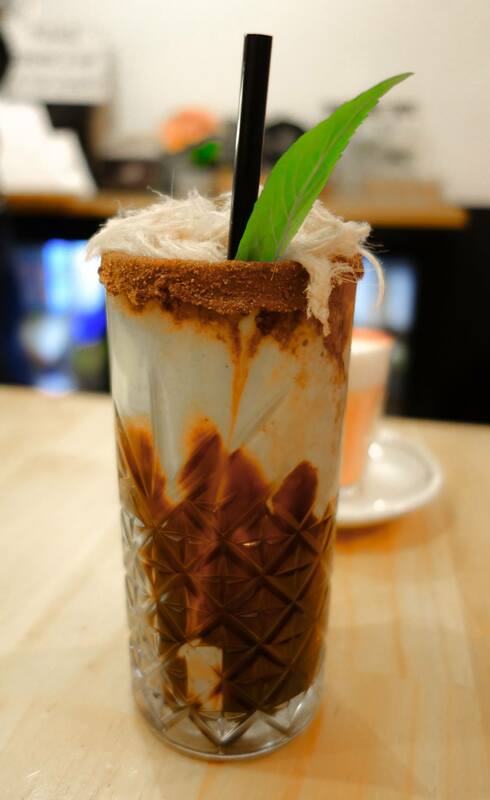 We also earmark the interesting avo/coffee/chocolate drink, the hypovocado which we enjoyed after our meal. The Genesis is another cool drink offering, an impressive berry elixir. Pour in some of their magic potion give it a stir and you will be holding a drink that looks like a glittering galaxy. The fact that Kusuka opens all day, means it has a range of food available and it is great if you are after a cheap eat. 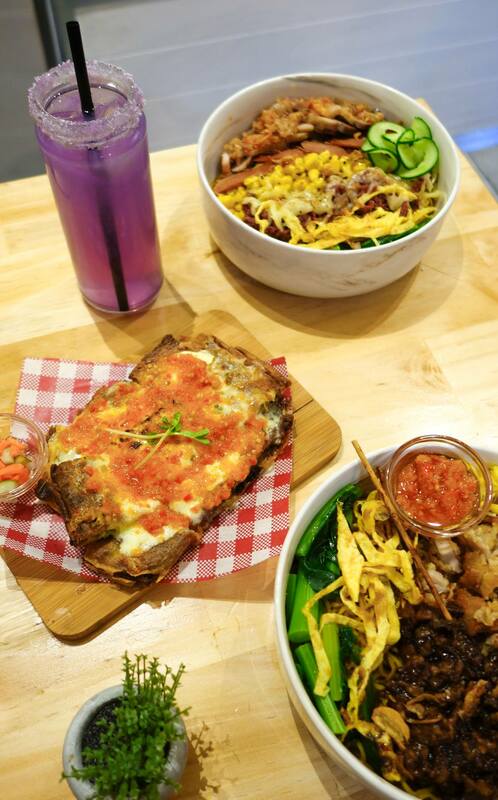 The savoury beef and cheese pancake called the Ultimate Martabak, an Indonesian style fried crisp pancake was full of flavour, the chili taichan providing a punch of spice. Staple of Indo cuisine are the mie goreng and the nasi goreng(fried noodles and fried rice) with ketsup manis (sweet soy sauce) as the main flavour component. Kasuka offers a variety of these staples served in a bowl. The Super Bowl a must if you enjoy mie goreng and meat. 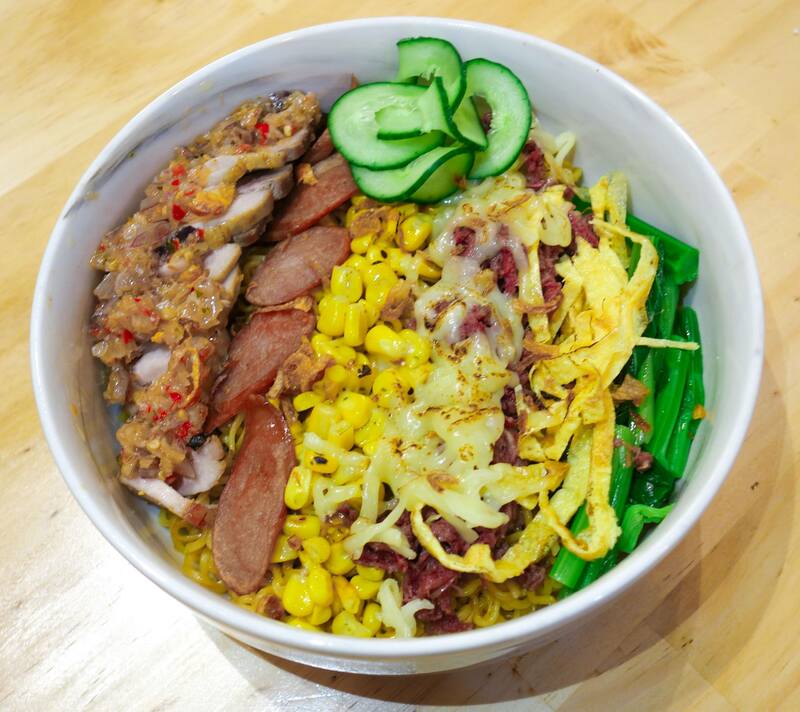 A double dose of noodles topped with an array of mouthwatering meat including pork belly, corned beef and sausage, for additional flavour there is the chili matah. Another tasty street food option is the double chicken rice bowl topped with their fried chicken and satay chicken skewers. This dish had us clucking for more. Having saved room for dessert, you know the hypovocado was happening. Usually associating avocado as a millennial favourite of smashed and served on top of toast, this drink has opened our eyes to the unknown diversity of the humble avo. This was a standout with this bizarre sweet combination of flavour strangely working very well. We also tried the pink latte, which was a refreshing watermelon and rose water flavour. They also do red velvet and matcha. 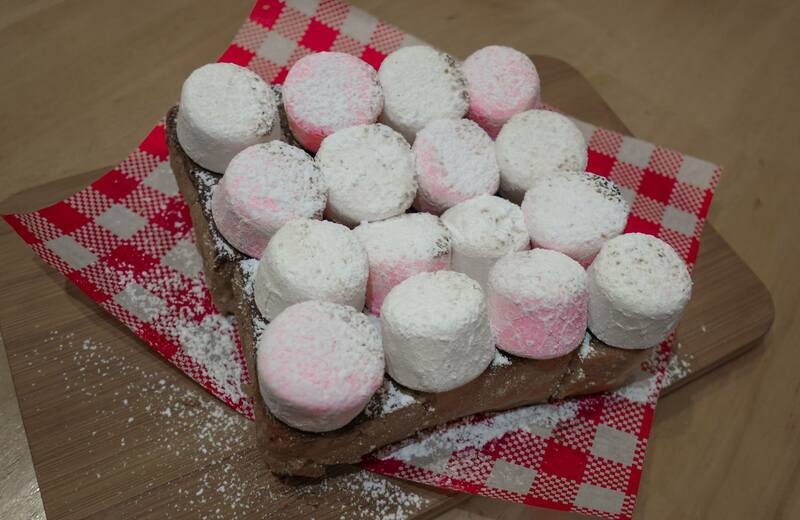 Another great sweet option for dessert is the ropang delight, a thick Indonesian sweet toast smothered in nutella and topped with toasted marshmallows, an Indo style smores. This was outstanding! A great little Indo Warung Kopi, with a playful menu. A fun cafe to visit, with reasonably priced Indonesian street food and some cool beverages. Thanks to Mario, Liz and their staff for their hospitality. We enjoyed chatting to Mario and the service provided was impeccable. We really enjoyed our visit and will return. 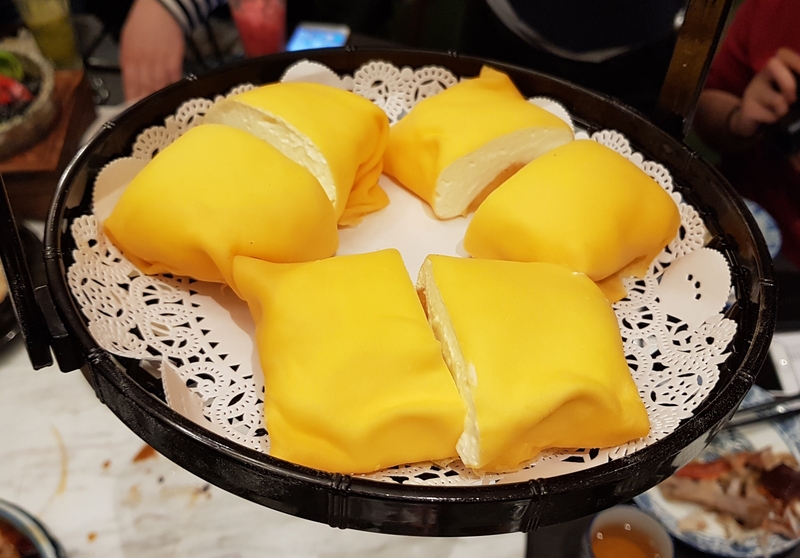 Haven Specialty Coffee is located close to central station and is a great place to pop in for some customised coffee or specialty tea and asian fusion meals.They are famous for their Hong Kong Styled egg waffles with interesting flavours; think red bean, matcha, ice cream and more! On this occasion savoury won over sweet. 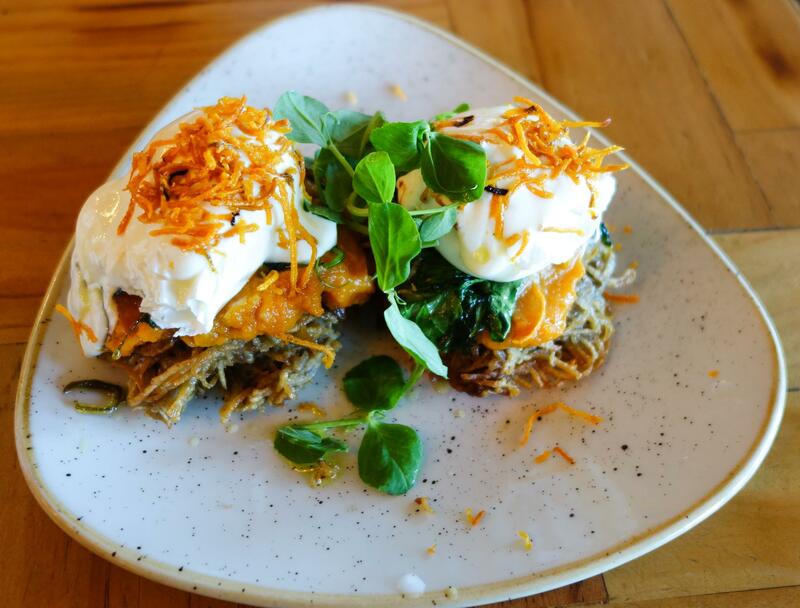 The option of choice was the hearty breakfast of poached eggs on potato rosti with sweet potato skordalia, yoghurt and burnt sage butter. 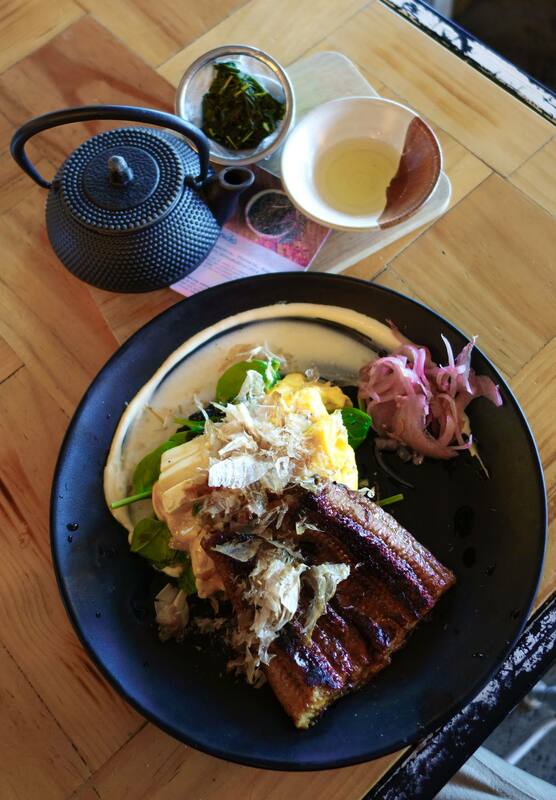 Being brunch, but in a lunch mood and loving Japanese food, the menu item named eel-ness was intriguing. Grilled eel(Unagi) nicely presented and served with silken tofu, scrambled eggs, house pickles on a black rice cake and topped with bonito flakes. Great flavour combinations and perfectly cooked eel with a delicious sweet caramelised sauce is a must. Despite this being a specialty coffee shop, we both had tea on this day, as they had a range of leaf teas brewed in a pot. 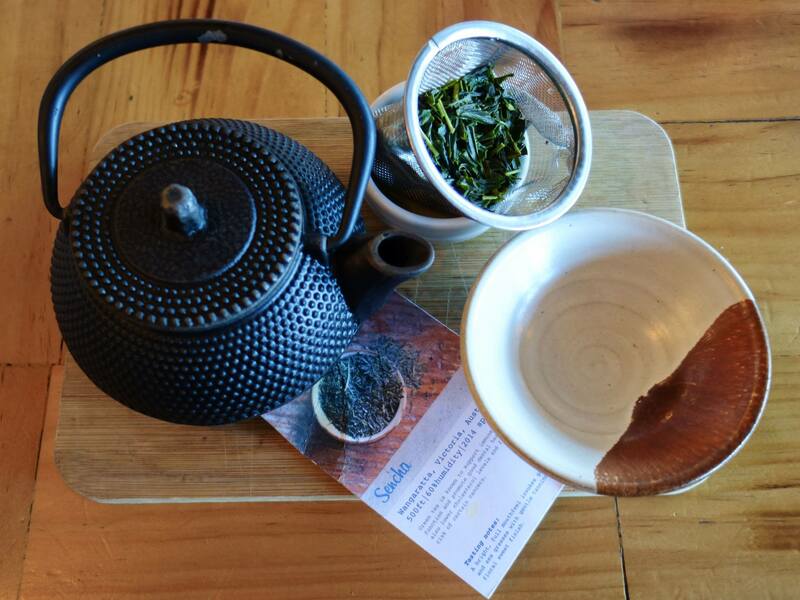 We tried the Japanese sencha and english breakfast. 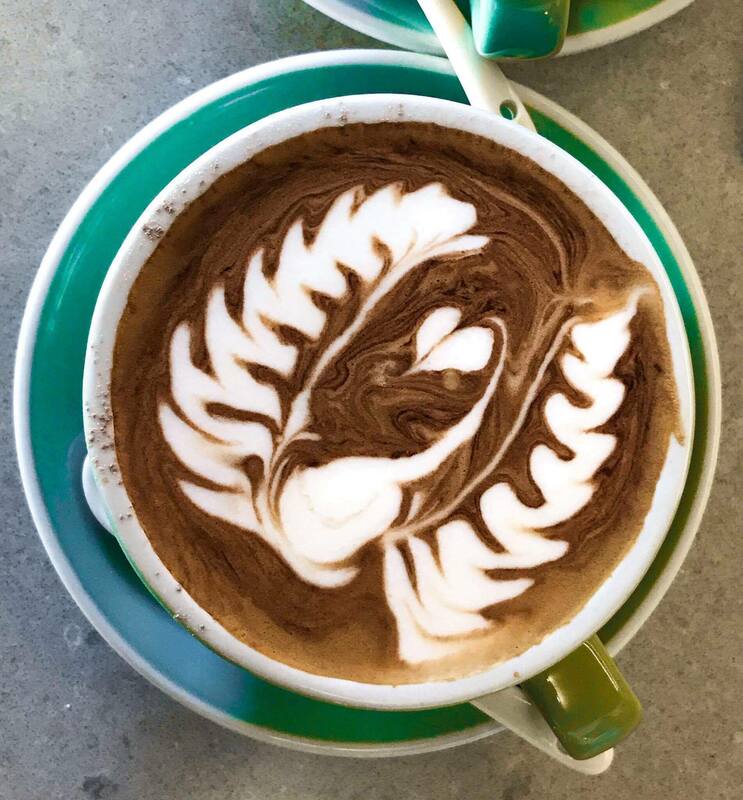 A good range of coffees and they also run specialty coffee appreciation classes, latte art classes, barista training with certificates. We would like to thank FCBA for giving us a voucher at their 1st birthday party to come to Haven and to haven for being so generous.